October 1949. Endorsed by Goldie Gardner. 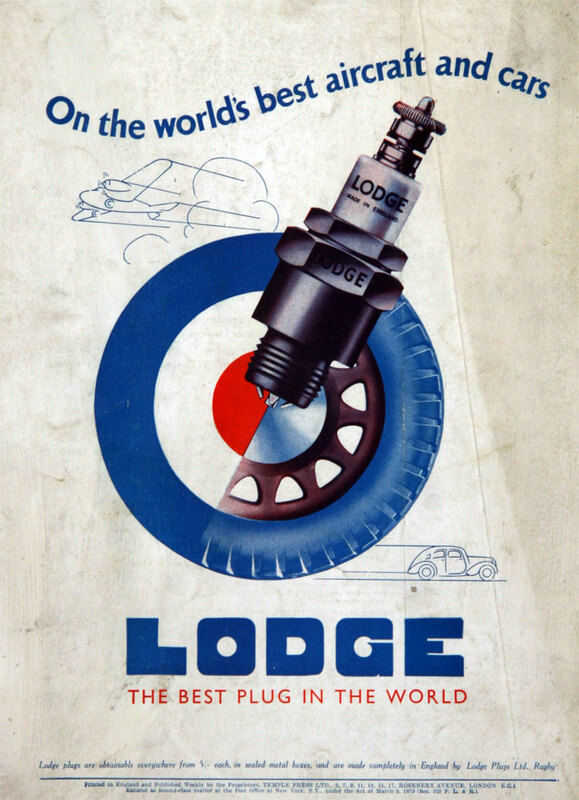 The Lodge brothers were the sons of Sir Oliver Lodge, the famous scientist. Brodie Lodge was twenty-three, and had served five years in the office of a shipping line in Liverpool. 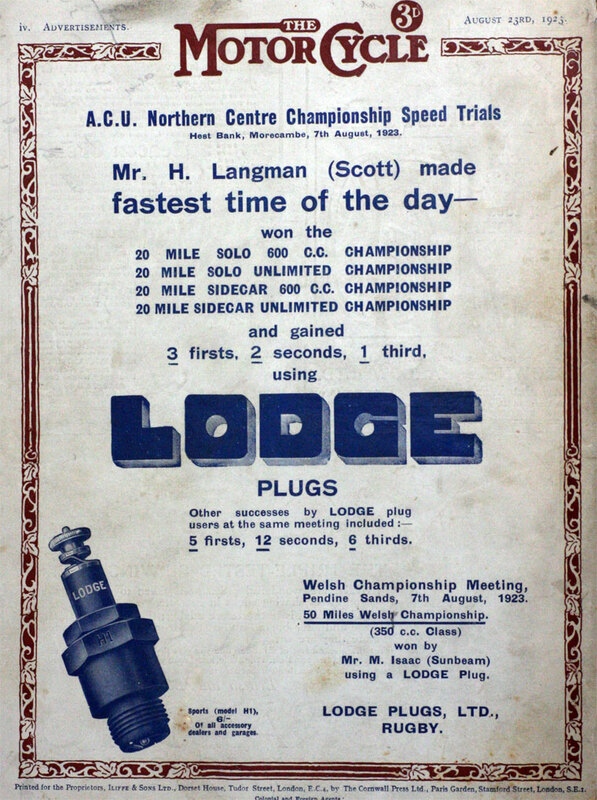 Alec Lodge was a year younger, and was working in the drawing office of the Lanchester Motor Co at Birmingham. 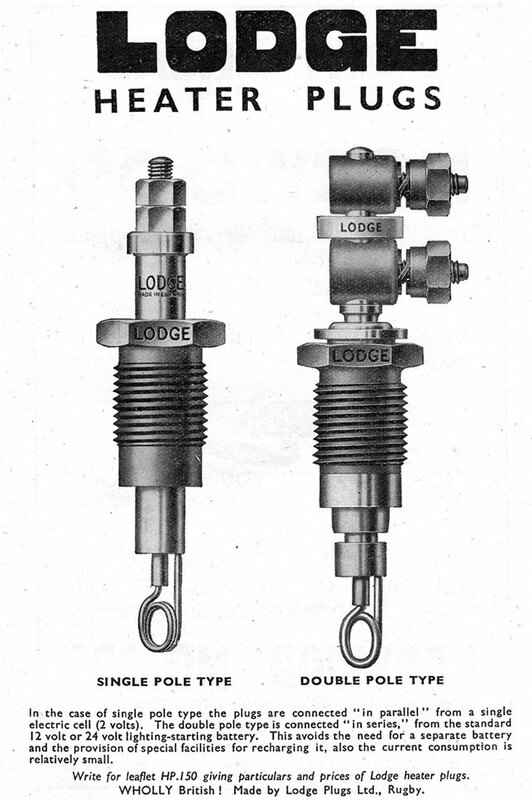 In 1903, they took out a patent for an improved system of high-tension ignition, which their father had discovered during his experimental work on electric condenser discharges. It was a "B" spark igniter using a Leyden jar. Alec looked after the technical side, while Brodie dealt with letters and accounts, doing the typing on his bed in his father's house at Edgbaston. 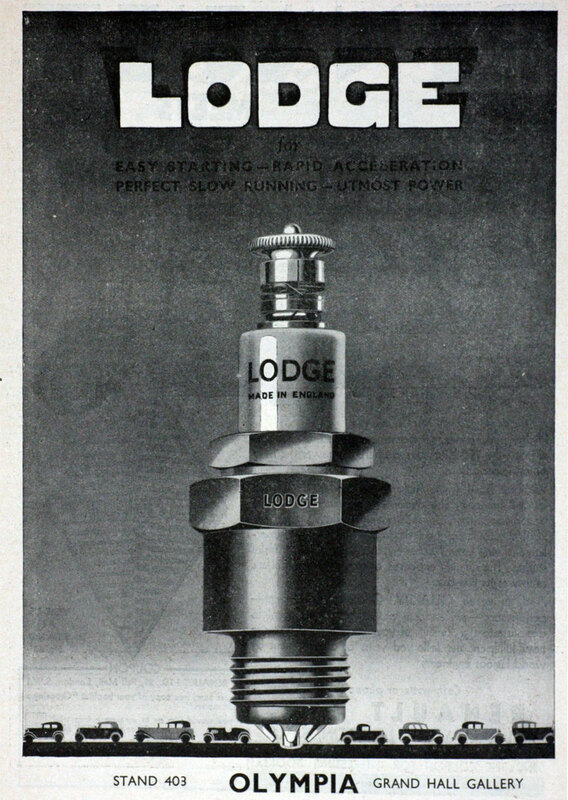 1904 They went into official partnership as Lodge Brothers, renting a one-room office at 14 New Street, Birmingham. In 1907, they built a new workshop and offices in Wrentham Street, Birmingham, and took a stand at the Motor Show at Olympia (the second to be held). 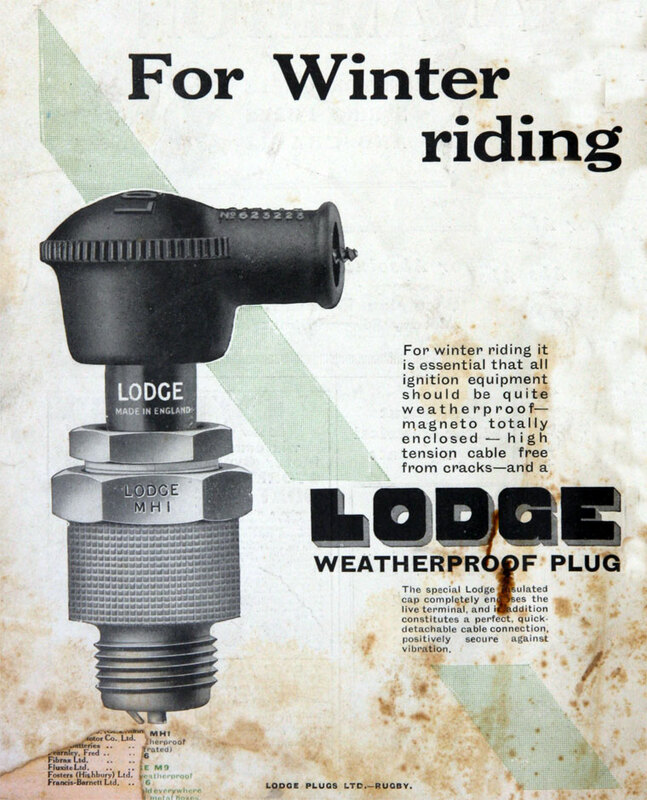 Alec Lodge's original mind was soon busily devising unheard-of ways of drawing attention to his products. 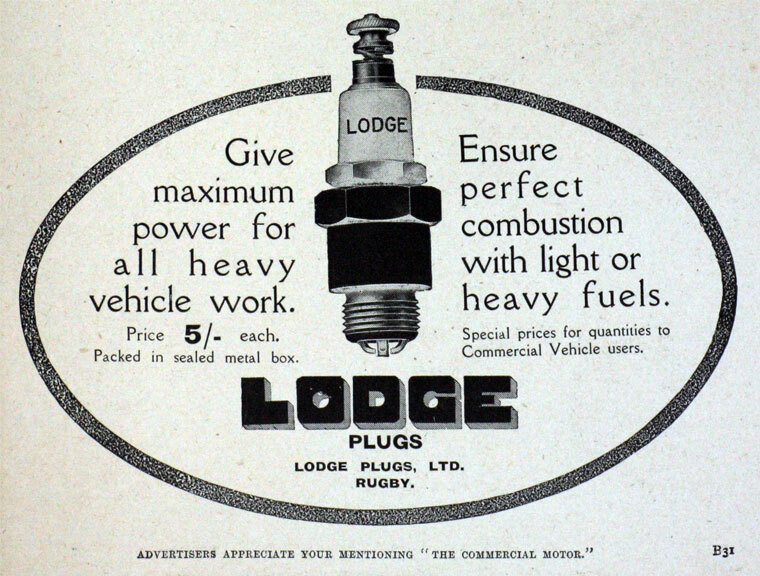 At their first Show the brothers were content to stand on a soapbox in the gallery and shout themselves hoarse in praise of their ignition system, but in the following year Alec went one better and fixed an enormous plug on their stand which sparked continually and caused an immense sensation. 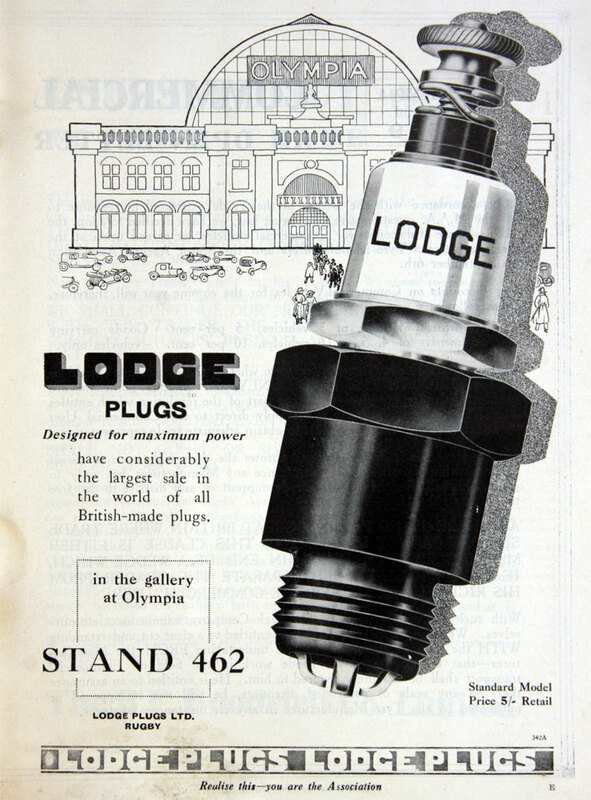 Less inventive exhibitors were furious, and the fact that the plug had secretly been connected with the mains was also against it. 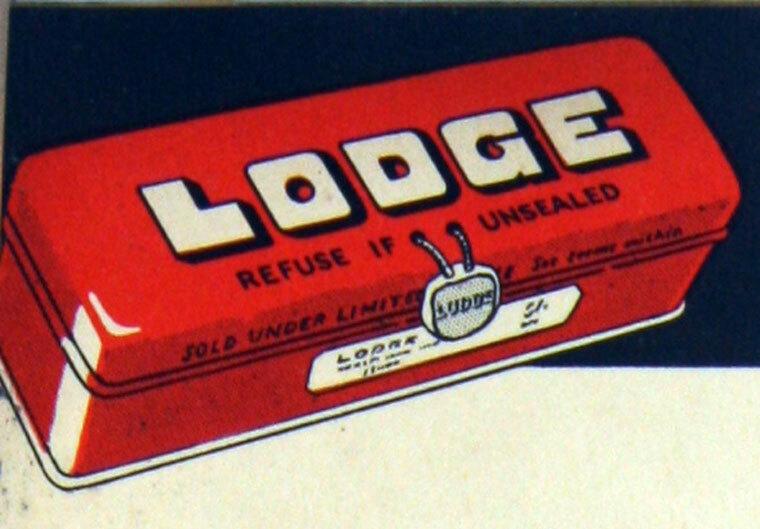 A ban was issued, but Alec Lodge was undeterred. 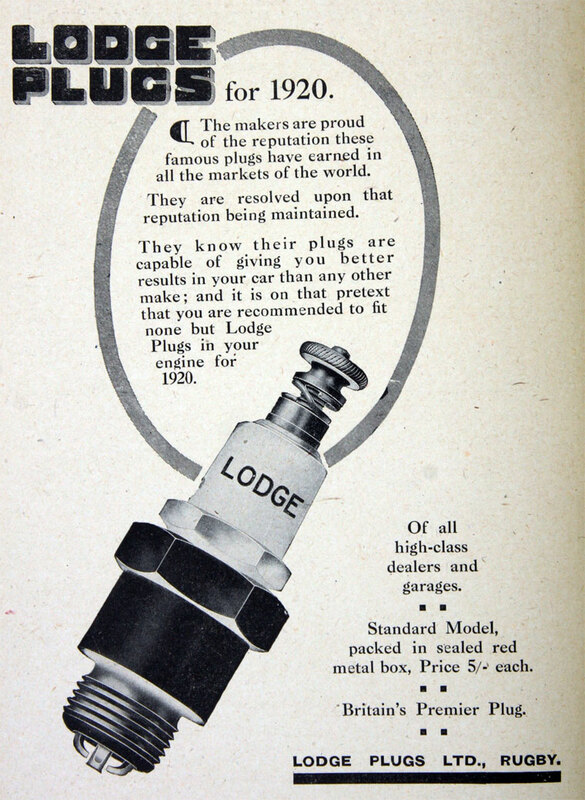 He arranged a battery of ordinary plugs which sparked the words LODGE PLUGS, and when this in turn was vetoed he spelled out the same proud message in lamps. 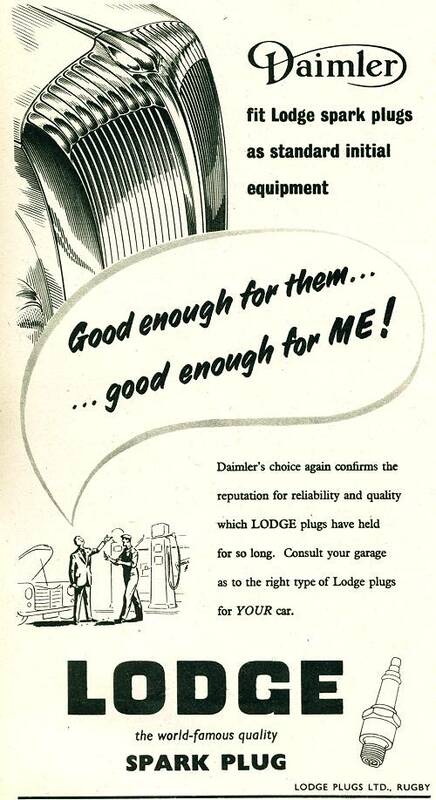 The firm had turned to selling plugs when the introduction of the Bosch magneto made their heavy coil system obsolete. 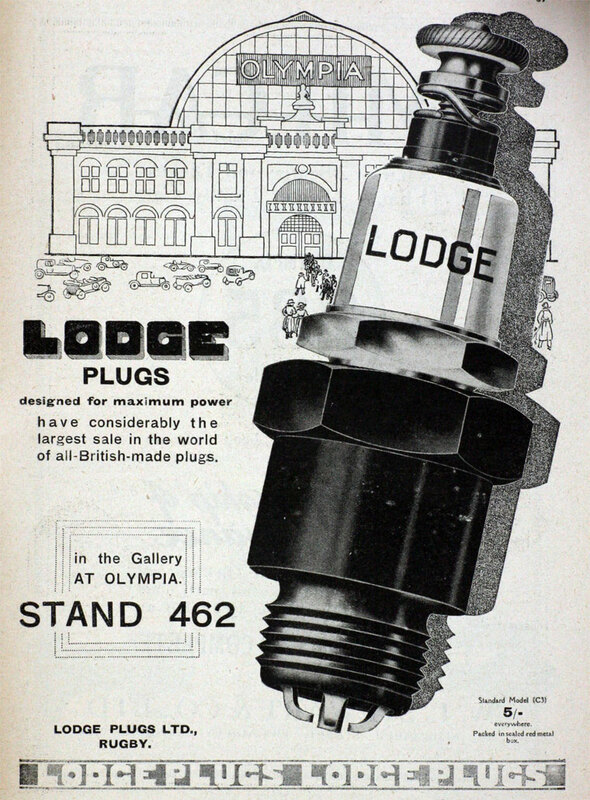 This new departure was suggested by H. G. Longford, of the Sphinx Sparking Plug Co at Birmingham, who urged that Lodge should design their own plugs and let him make them under their name. 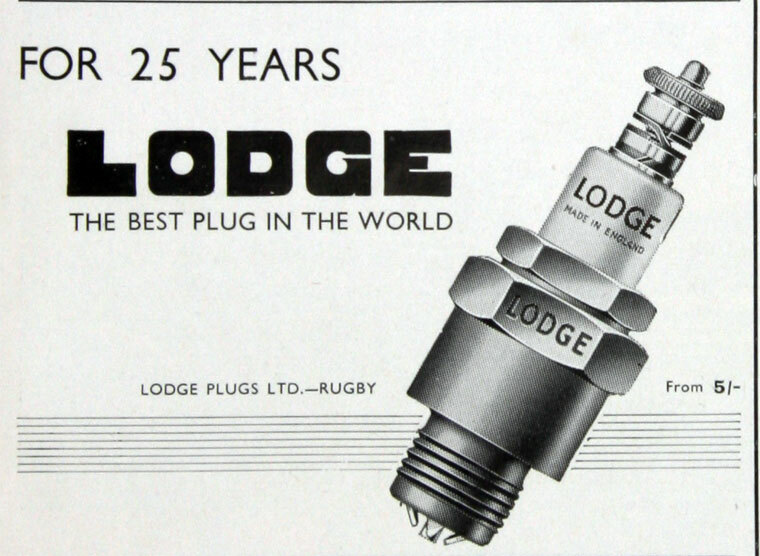 At first reluctant, the partners finally agreed, and Alec Lodge's designs soon proved their superiority to the ramshackle plugs of the day. Gas tightness and insulation were his two main difficulties. 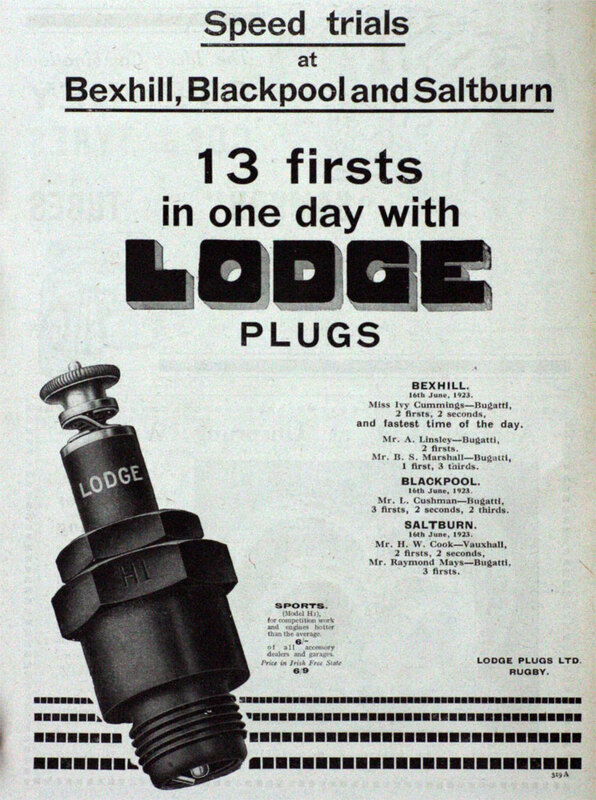 To begin with he used porcelain insulators, made by French peasants, which sounds strangely amateur today. A single shoulder was seated on a soft copper asbestos washer, its top being wrapped with several turns of asbestos string secured-and, it was hoped, made gas-tight - with a brass gland nut. 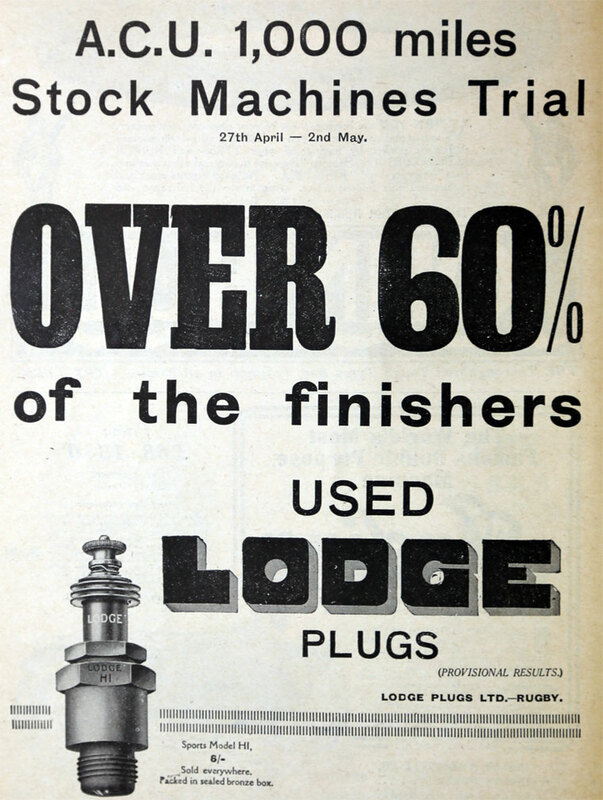 When plugs were returned to the factory as defective they were given a bench test on a 3 h.p. motor cycle engine, for in those days nobody expected them to stand up to the tresses of high compression. 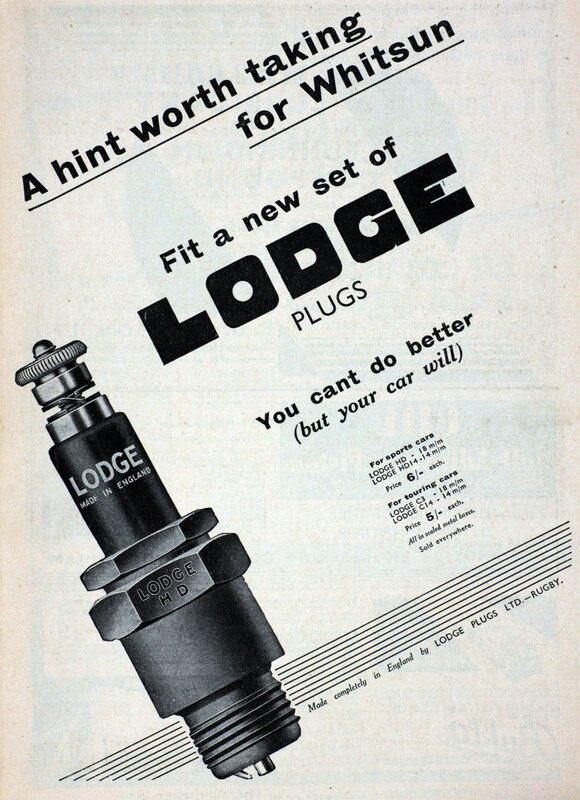 At the Motor Show - already a social feature of London's autumn season - Lodge Bros. continued to cut a dash, but in addition Brodie Lodge, who was now in charge of publicity and staff management, began to advertise widely in both national and trade papers. 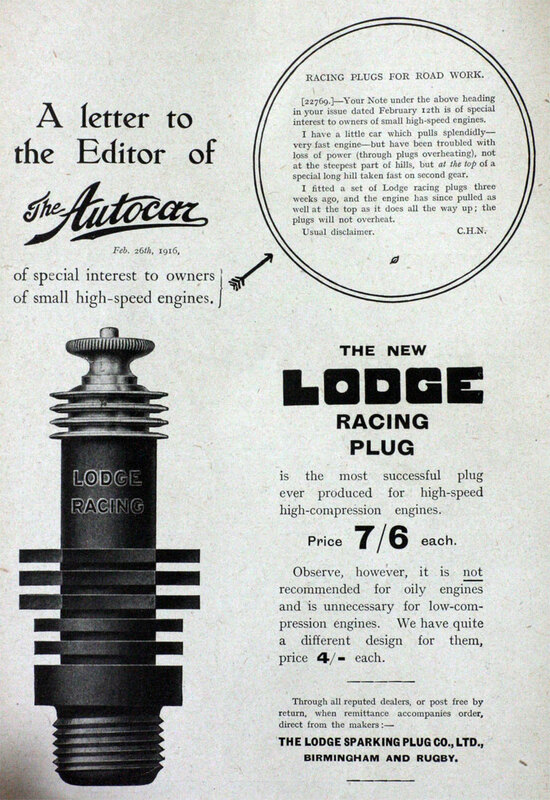 And further interest was stirred up among the new and very keen motoring public by Alec Lodge's provocative letters in editorial columns on the whole subject, still highly debatable, of electric ignition. 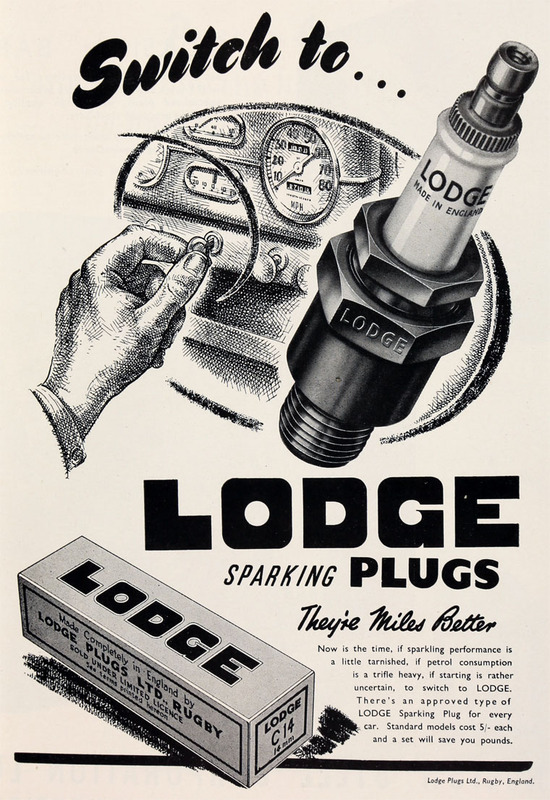 In these ways the name Lodge became increasingly known for sparking plugs suitable for cars, motor cycles, motor boats, and for gas and oil engines as well. 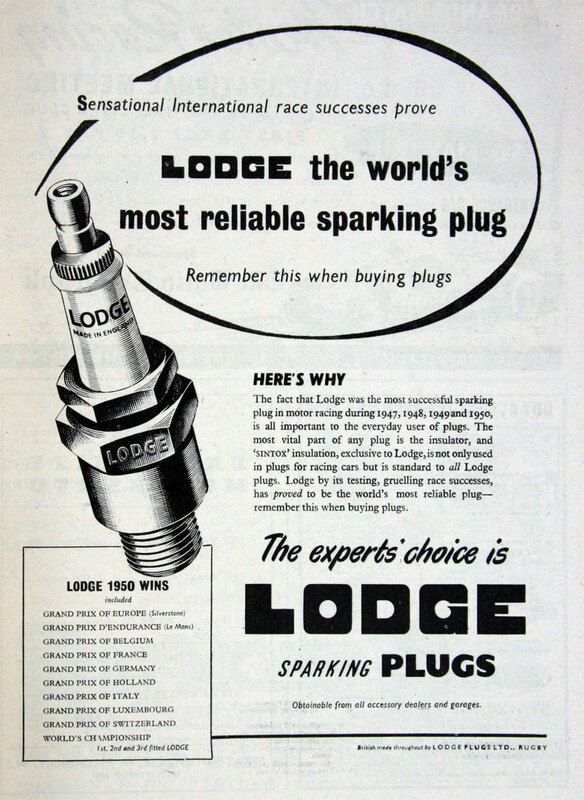 Another inventor of resource was developing the sparking plug. Bernard Hopps had left the British Thomson Houston Company in 1908 to form his own Mascot company, and a year afterwards he took out his important patent for making a gas-tight joint in a plug by means of fused glass. 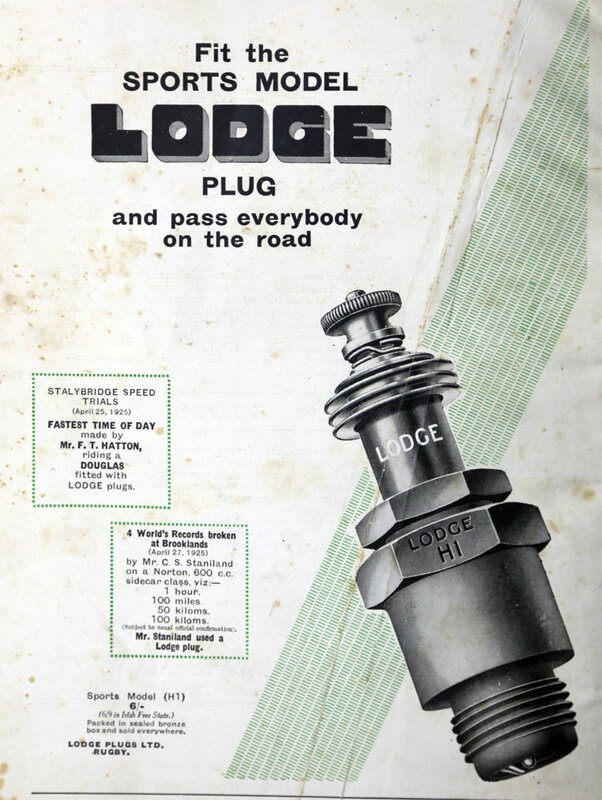 This idea was such a great advance that it quickly gained recognition for the Mascot Plug, in particular from Herbert Austin, who fitted it as standard in the Wolseley car. Originally occupying a part of the premises at Hunter's Lamp Factory, in Lower Hillmorton Road Rugby, the firm moved two years later to a small factory in Albert Street. 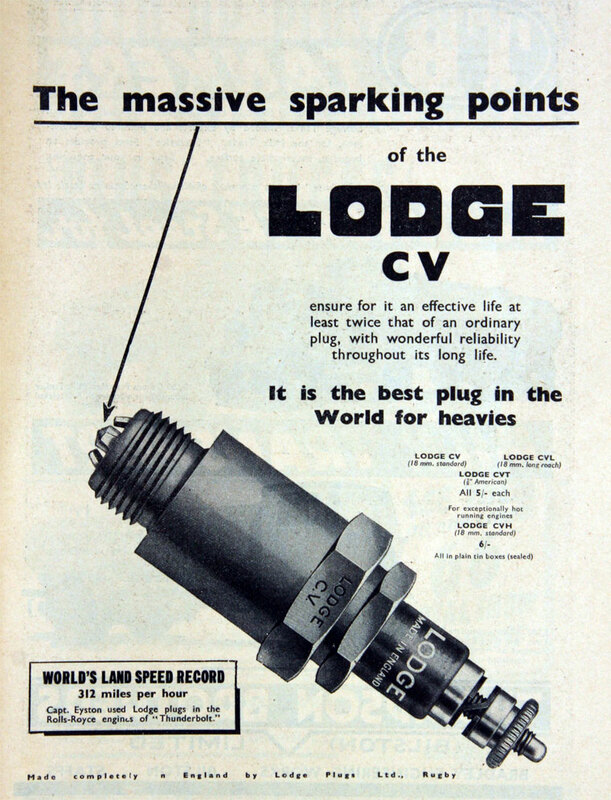 1913 Both Lodge Brothers and the Mascot Company had the common aim of producing the best possible sparking plug. 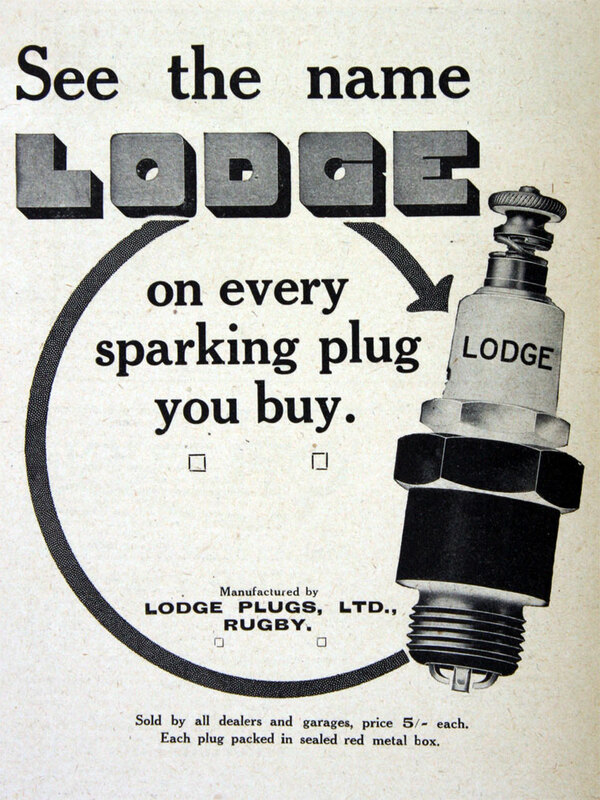 Both firms had much to offer one another, and so in 1913 they decided to amalgamate, under the title of the Lodge Sparking Plug Company Ltd. This retained the Wrentham Street premises in Birmingham and the factory in Albert Street, Rugby. 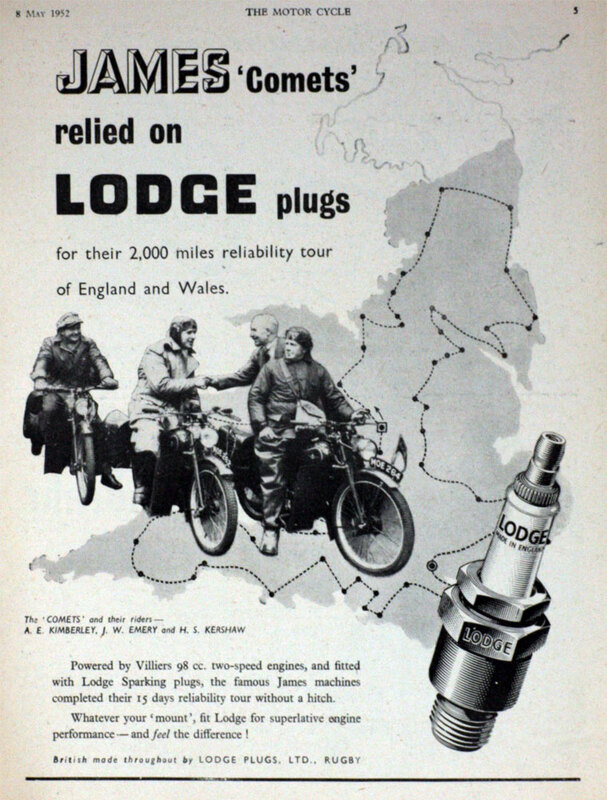 It was still a private company, with the Lodge brothers and Bernard Hopps as joint managing directors, and Alfred Hopps, a well-known Leicester accountant, as Chairman. 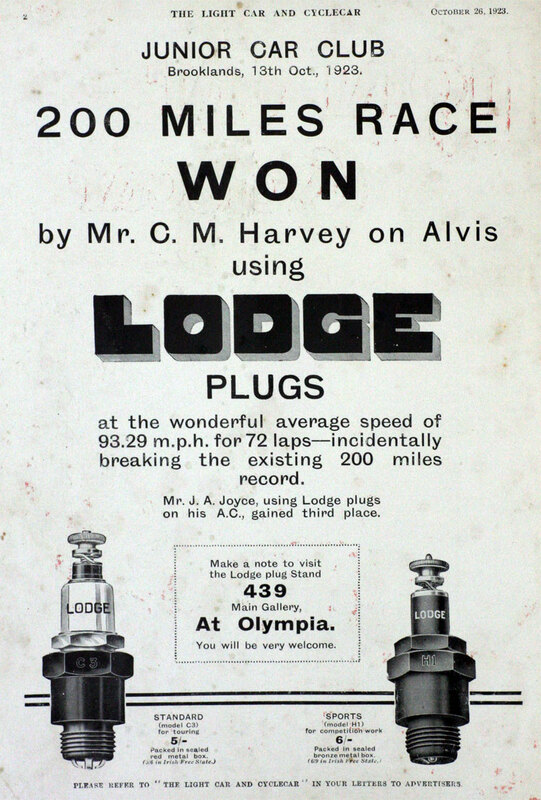 And it still remained very much a family business, in which Raymond and Honor Lodge, brother and sister of the Lodges, took part. 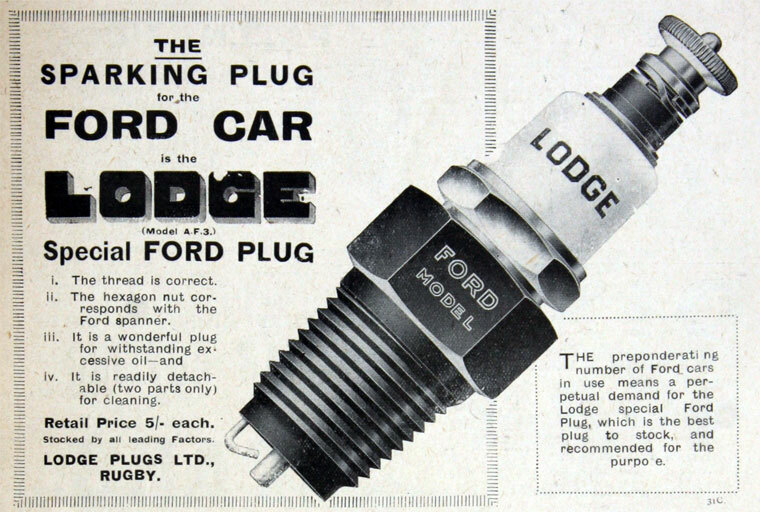 As a result of the merger, the hopeful motorist gained for the first time an efficient, gas-tight, non-detachable plug; and when a little later mica was introduced for the insulation of the centre-pin the internal combustion engine was carried a stage further towards reliability. New cars were beginning to roll out of the factories in much greater numbers, and far fewer now died by the side of the road from spark failure. 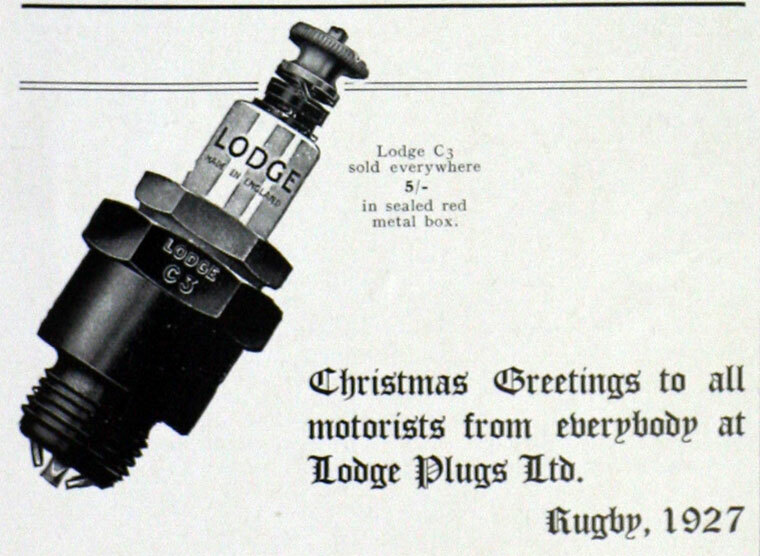 Lodge continued to do a minor trade in coils and distributors as well as plugs, and about this date added to its products an electric lighting set whose magnificence was the envy of all those hardy drivers still struggling with the nightly horrors of oil and acetylene. No one who has not stood striking match after match in the rain can begin to understand the feelings of the early motorist when he first pressed a lighting switch inside his car. 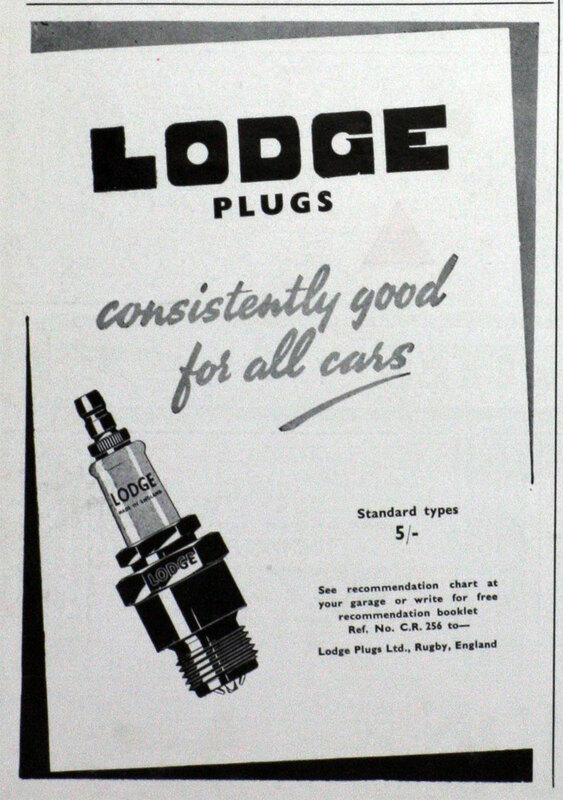 Lodge were honoured when they were labelled a Controlled Establishment, and told to concentrate on aero plugs. 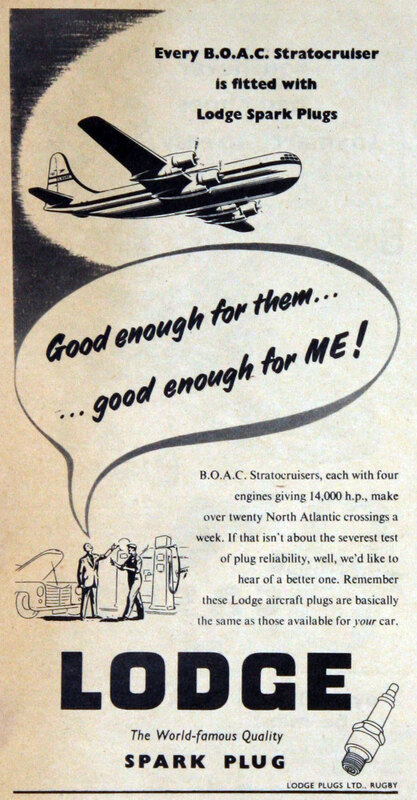 At the same time they had to think smartly, for the problems of the aircraft engine were entirely fresh to them. 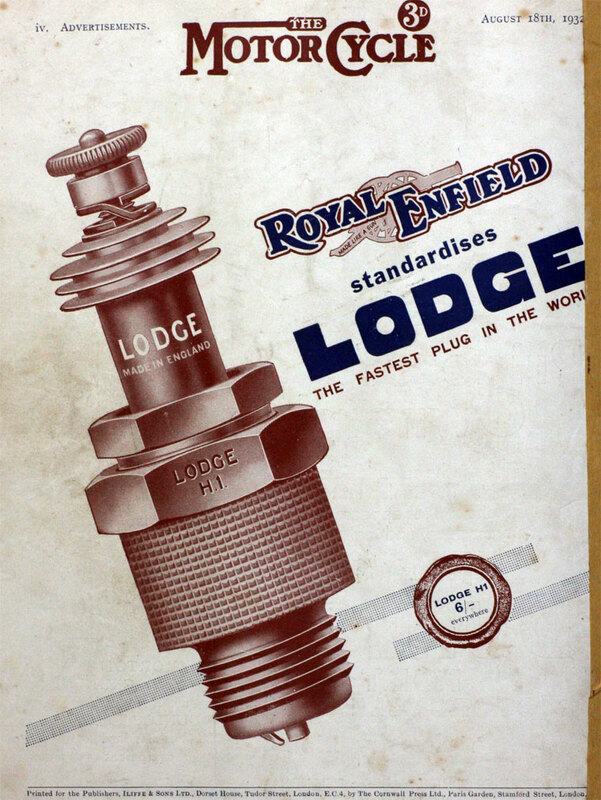 Experimental research was started immediately at the company's laboratories, in an urgent hot-house atmosphere, and resulted in a novel type of mica-insulated plug to be known throughout the R.F.C. as the Pepper Box Type. This was fitted mainly in Rolls-Royce engines, whose designs were themselves being developed with equally dramatic speed. 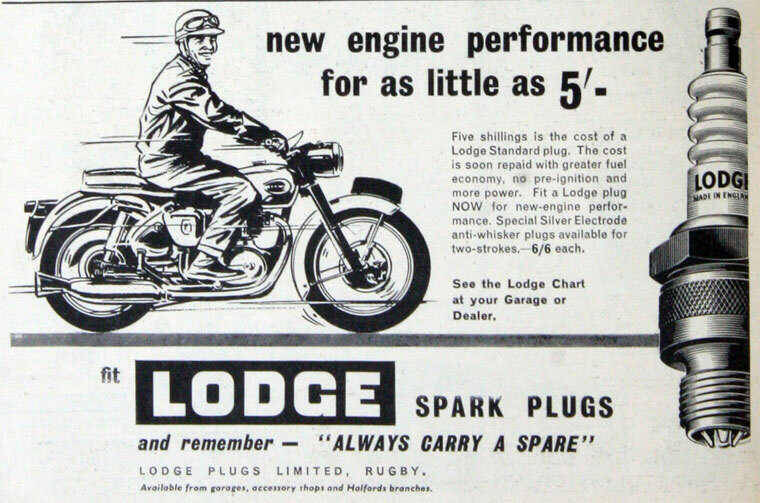 Engine temperatures rose considerably, and the new plugs had to be able to stand up to them while sparking at high pressure, and rates already reaching 1,500 sparks a minute. 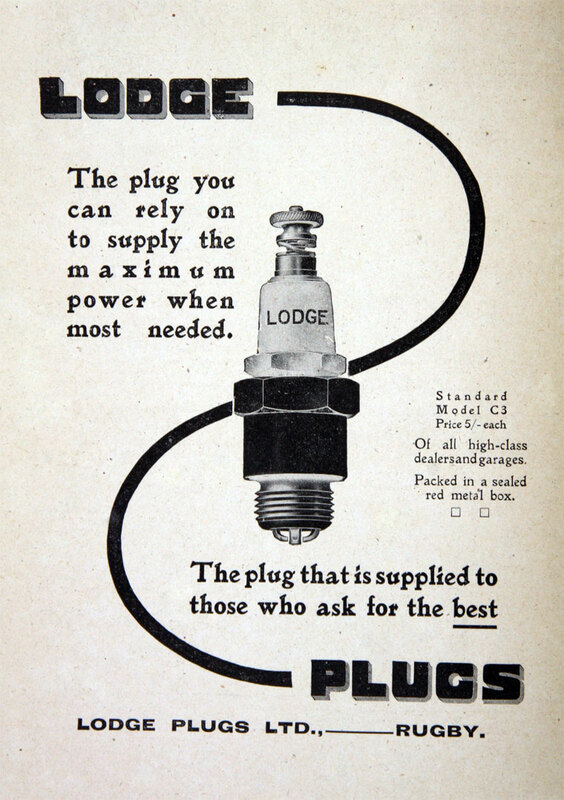 In this field, two particular advances in their wartime plugs helped Lodge to establish a unique position: copper sheathing to disperse the heat in the electrodes, and the mounting of the washers within the body of the plug. From the point of view of manufacture mica insulation was an extremely laborious process, but in spite of that millions of Lodge aircraft plugs were contributed successfully to the new arm. 1916 During this intensive period the inconvenience of premises divided between two towns became apparent, and in 1916 the present factory in St. Peter's Road, Rugby was completed. When the whole business was transferred to it plans for increased production went ahead more easily. 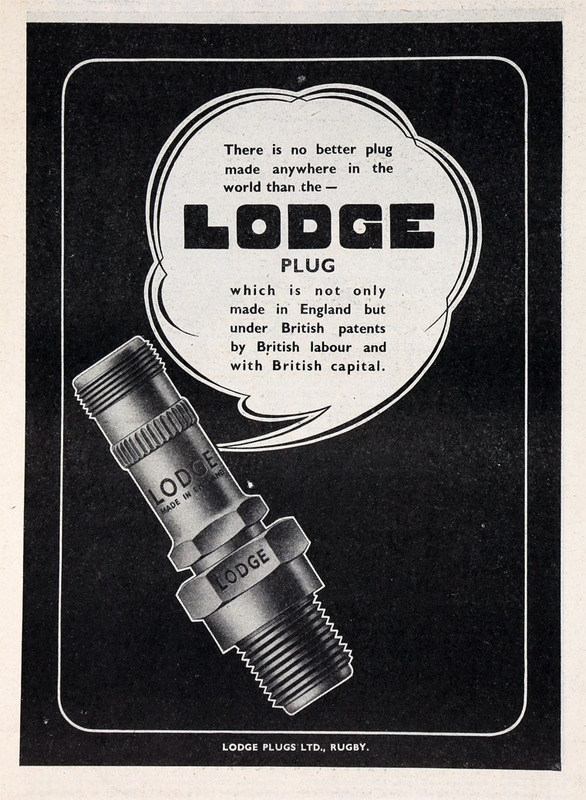 1919 Just after the First War, the capital of the company was increased, and its name shortened to Lodge Plugs Ltd. But still it remained a private concern. 1920 As soon as the war was over, it became obvious that the aeroplane would not be widely used again for some time. The newly formed R.A.F. had been severely cut, and civil air transport was still only in its infancy. 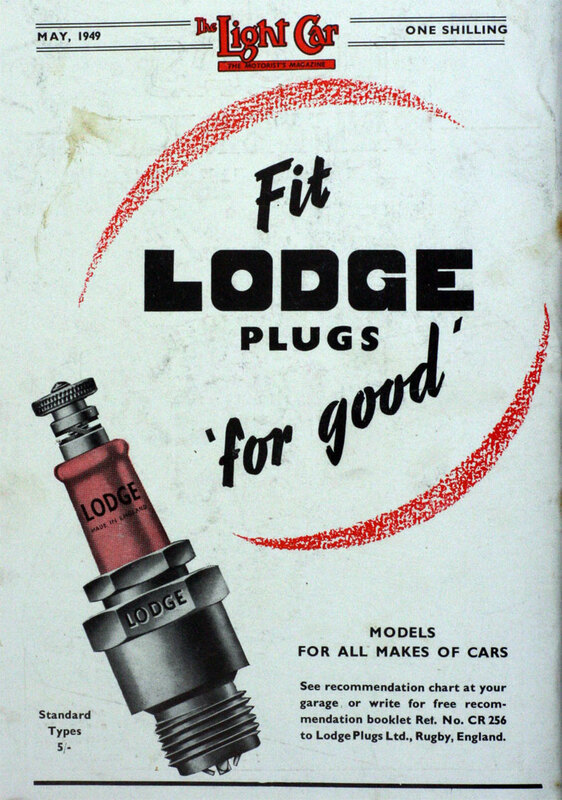 Lodge therefore decided to soft-pedal their production of aero plugs, and concentrate on the land market. 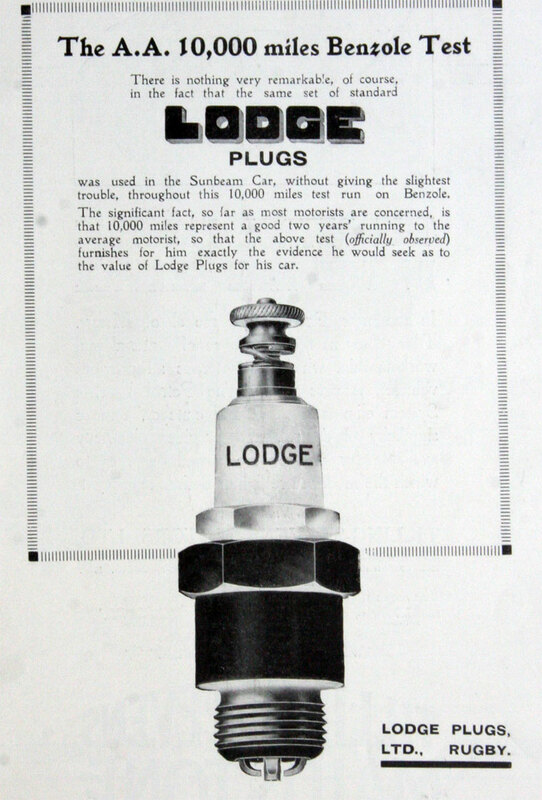 A witness to this intention was their publication, in 1920, of the first plug Recommendation Chart in the motor industry, from which a motorist could see at a glance the type of Lodge most suited to his vehicle. 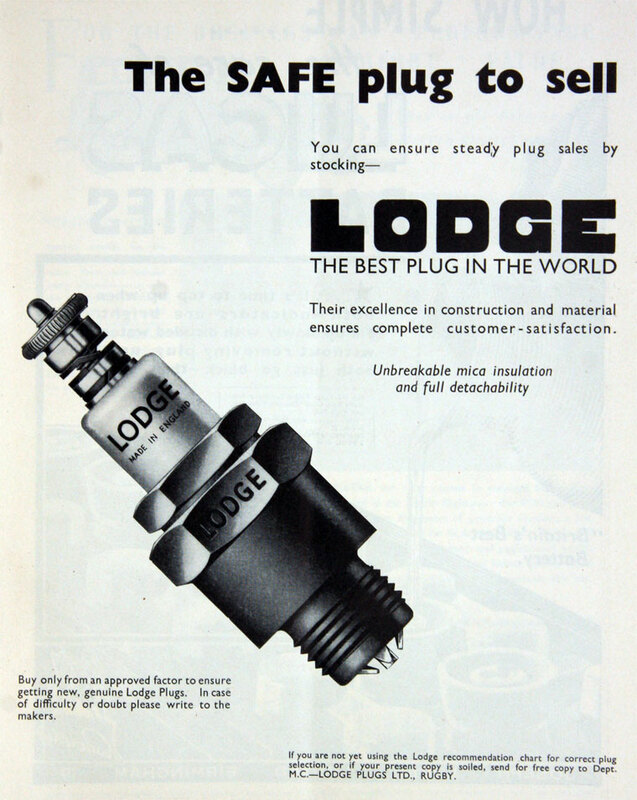 For a year or two, the great number of war surplus plugs in circulation made selling conditions difficult, but in the meantime the Lodge Laboratories were working on new methods and new designs. The use of steatite (soapstone) insulation was tried. 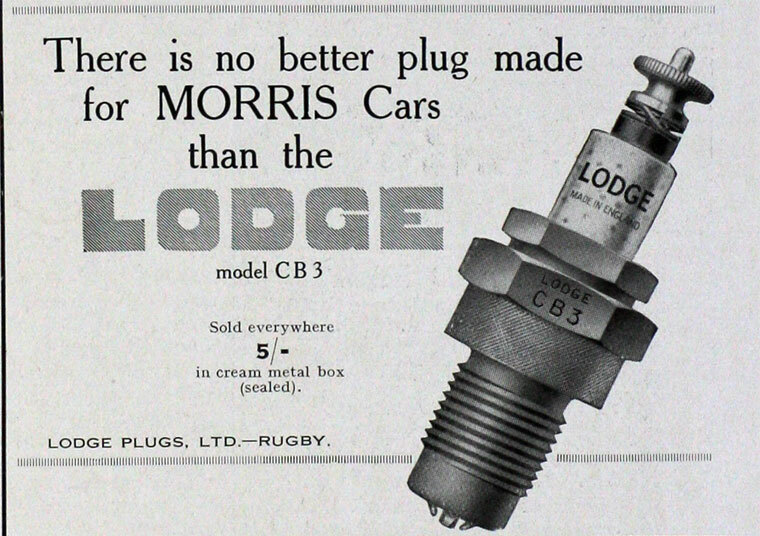 It was not, however a complete success, and in the famous C3 plug the company returned to mica insulation. 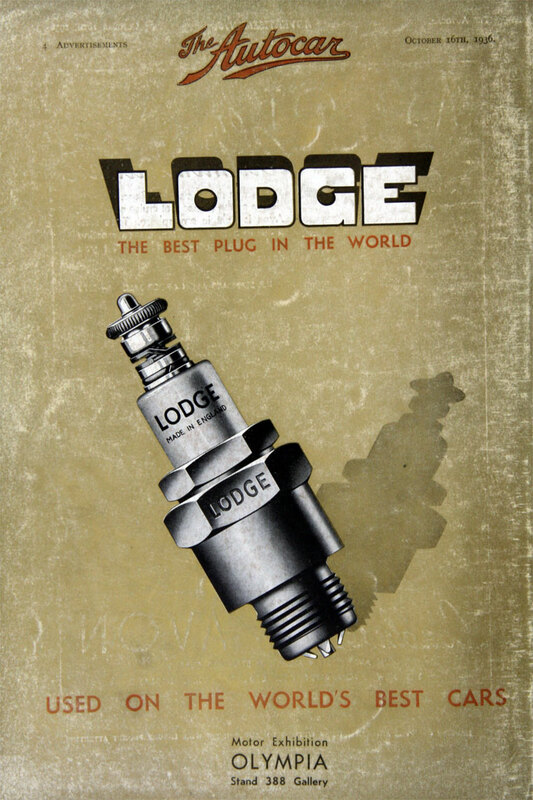 This plug had a mica-wrapped core round the electrode, and was finished externally with a steatite sleeve as a protective cover. 1929 Its versatility was shown when it was chosen by Sir Charles Kingsford Smith for his record non-stop flight from England to Australia, in the "Southern Cross." 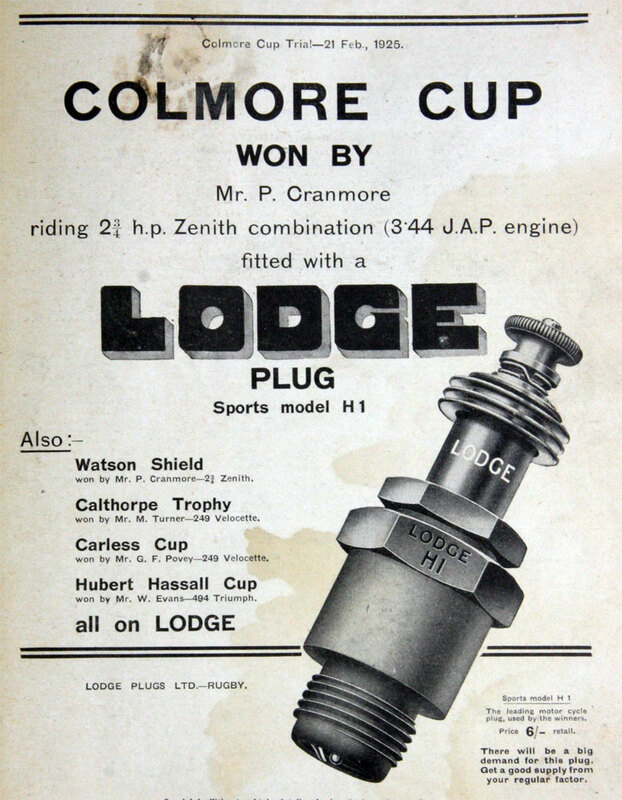 It was the parent of the well-known BR series of Lodge motor-racing plugs, and a stepped-up sales campaign soon made it extremely popular with the ordinary motorist. 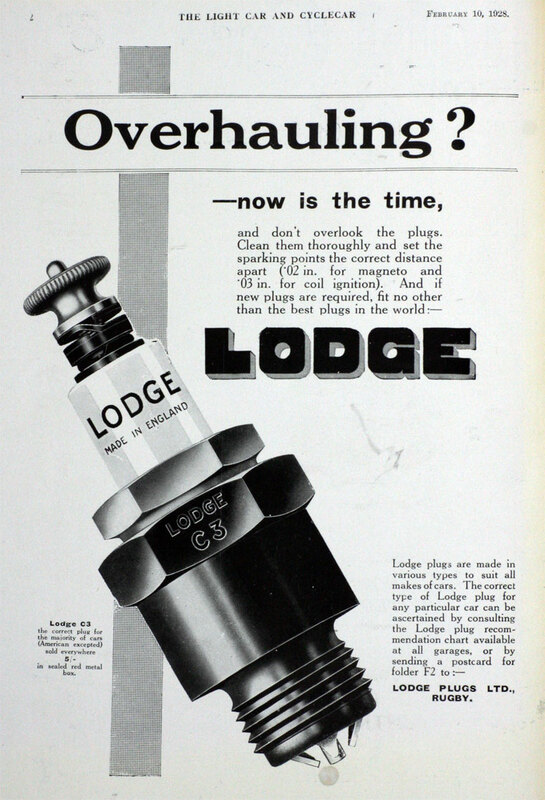 During the 1930s, Lodge advertising began to hit very hard, on a national scale. 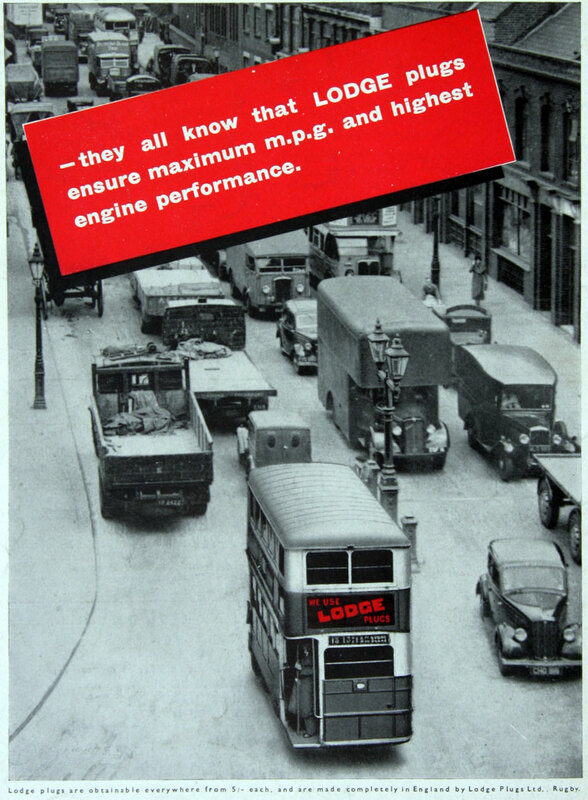 Almost every back page of the motoring papers was reserved, and Lodge became a familiar name in the rear panels of London's buses, where it had every right to be, since it was already under their bonnets. 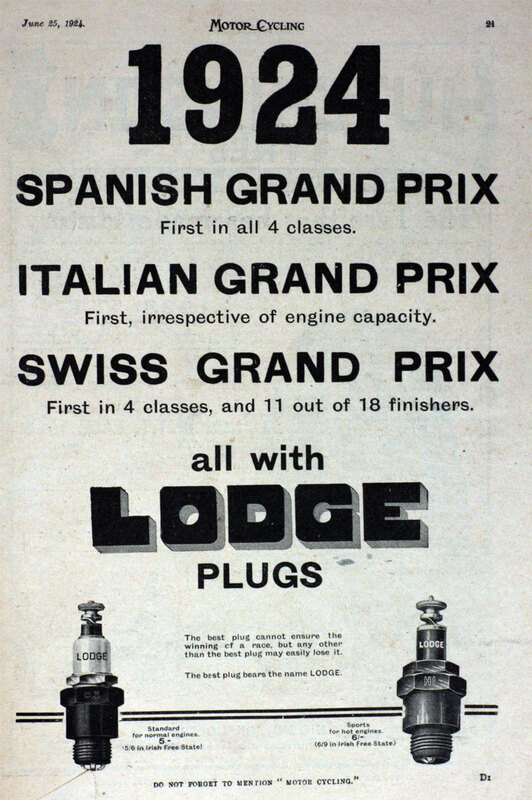 The Motor Show continued to be a vital focus for publicity, and while it was open many central column advertisements appeared in the leading daily papers. 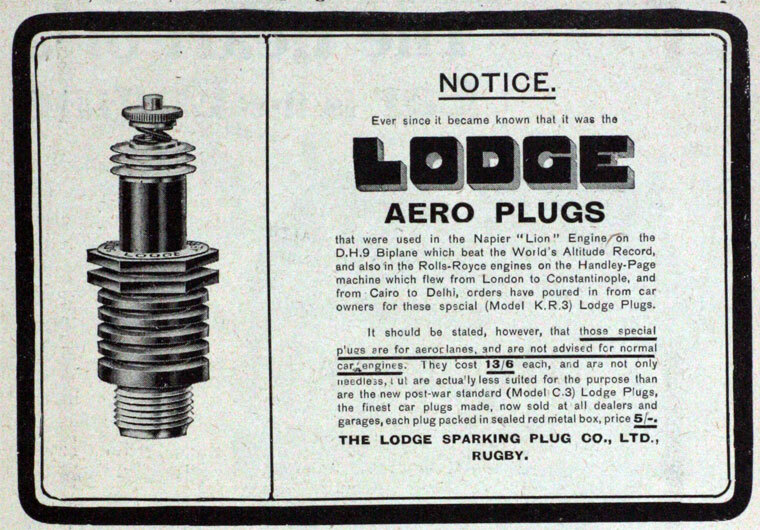 With the sales of their plugs for land and marine engines increasing steadily, the directors had felt able to revive their interest in the aero plug. 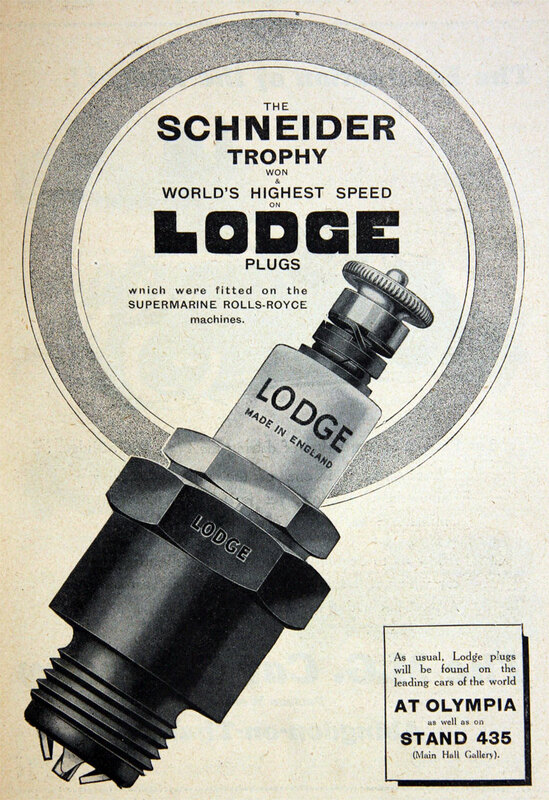 Research work begun about 1926 resulted in the A 30 and the KR 3 series, the latter to win a great name for itself as the plug used by the British team in the Schneider Trophy Race of 1931. Not content with this spectacular success, Alec Lodge and Bernard Hopps had set on foot large-scale experiments to test out their idea of producing an improved insulator from aluminiumn oxide. They worked first with Mr. Gatecliffe as their chief chemist, and then with Mr Donald Turner. The experiments took time and capital, but the partners were confident they were on the verge of a great revolution in plug design. Special chemical laboratories had to be built in the factory, and new plant laid down with very high temperature tunnel ovens. 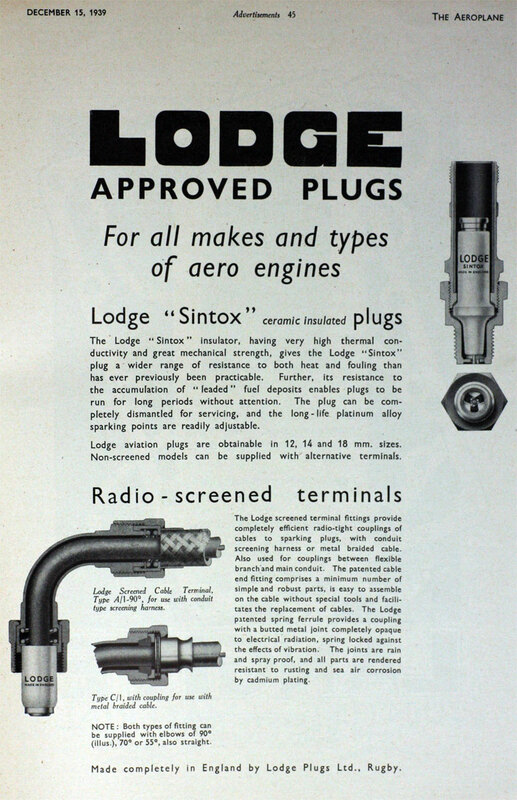 1935 All this complex research triumphed with the arrival of Sintox, a pink ceramic that came from sintered aluminium oxide and possessed remarkable thermal, electrical and mechanical properties. As an insulator it had all the advantages of mica, yet none of its drawbacks. To the old porcelain and the other ceramics it was found immeasurably superior. Soft and pliable in the first stages of manufacture, it could be extruded, moulded and turned on a lathe as if it were metal. Fired in a very hot oven it became as hard as glass but not in the least brittle. And apart from its extraordinary inherent qualities, it brought smiles to the faces of the production engineers, for whereas the mica sheets from which the insulators had previously been wound were fragile as well as expensive, Sintox was far more easily handled. 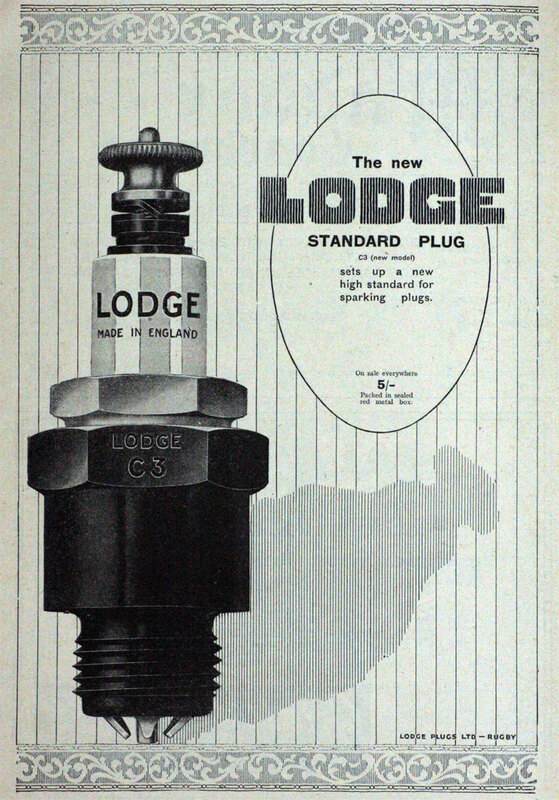 Its commercial introduction into Lodge plugs, in 1936, changed the most difficult stage in their manufacture from one that called for highly skilled labour to one in which careful control of machine processes was all that was necessary. 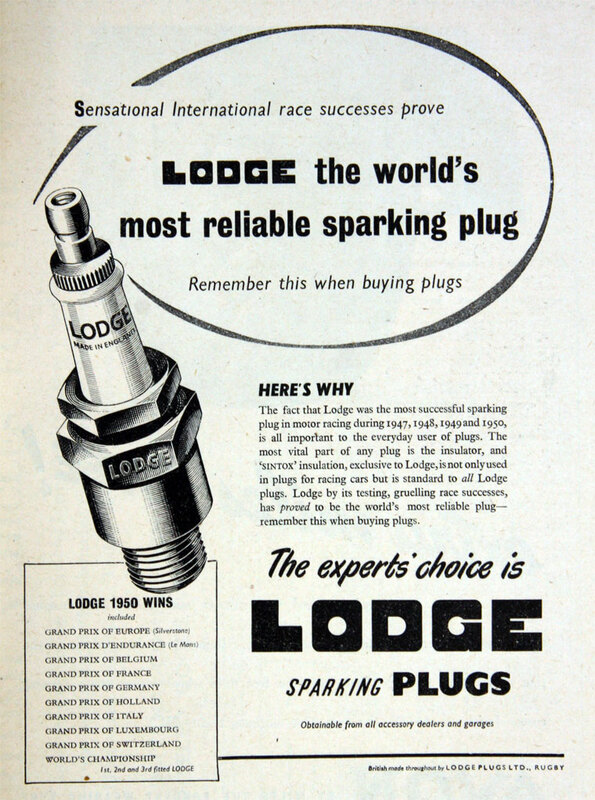 1938 For the many colleagues who held him in deep affection it was comforting that Alec Lodge had seen ample proof of the full success of Sintox before his death in 1938. His qualities of inspiration and foresight, which were to be so much missed, were also the qualities which while he lived had placed the firm in a secure position where it could carry on efficiently without him; for in his long association with Bernard Hopps he had continuously developed its technical resources, and brought on a group of younger scientists able to make their full contribution towards research and design. 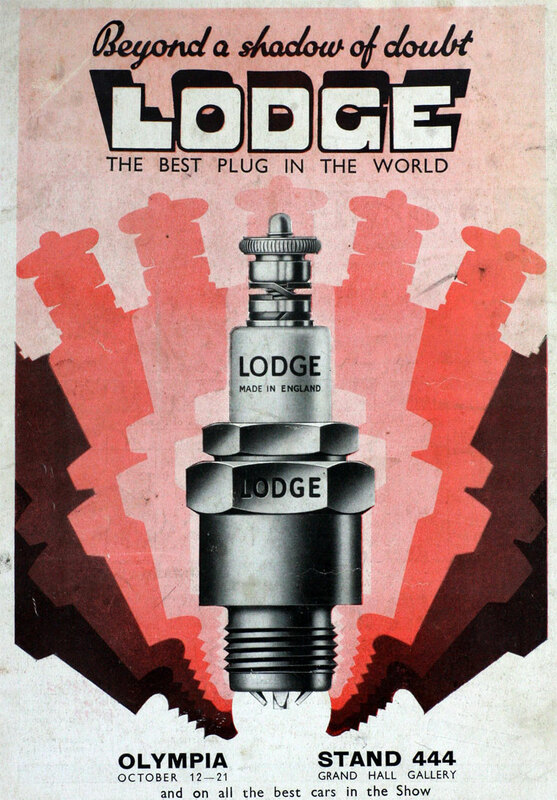 And fortunately Bernard Hopps (now in charge of production) and Brodie Lodge were still there to lead them when a year later, for the second time, Lodge Plugs became of national importance in a world war. 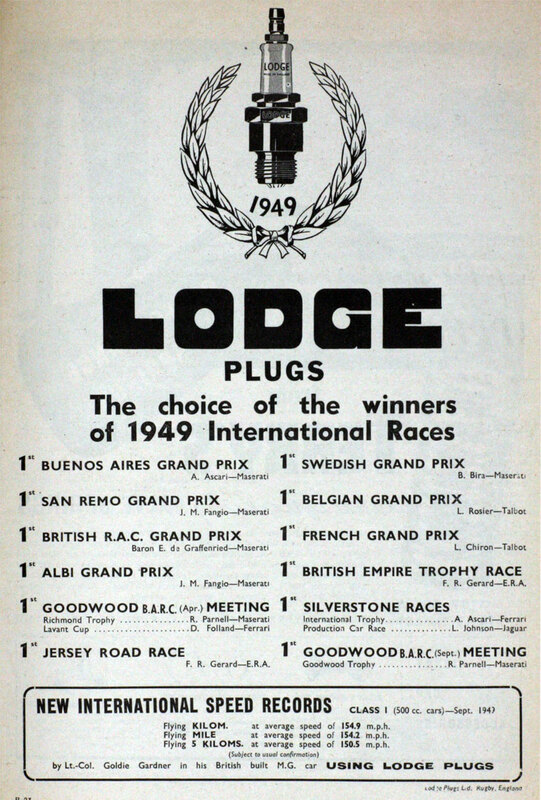 In 1939, an historic meeting took place at Rugby. Feeling that scientists working on ignition had much to offer one another, Dr. C. J. Smithells, the Lodge general manager, called the first British conference to discuss the co-ordination of research into the whole field. This meeting was in the nature of a trial balloon. 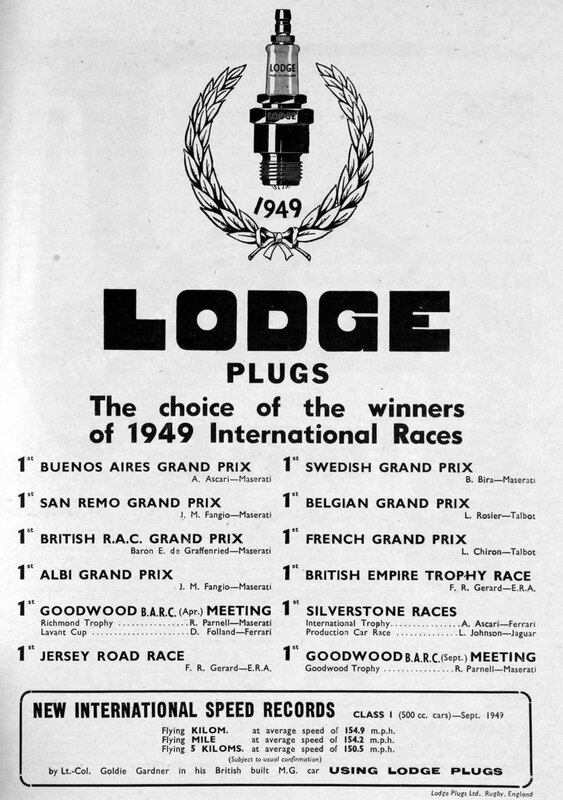 Not much came of it immediately, but it marked the course for the annual, and very important, European Ignition Conferences which Lodge initiated in 1950. 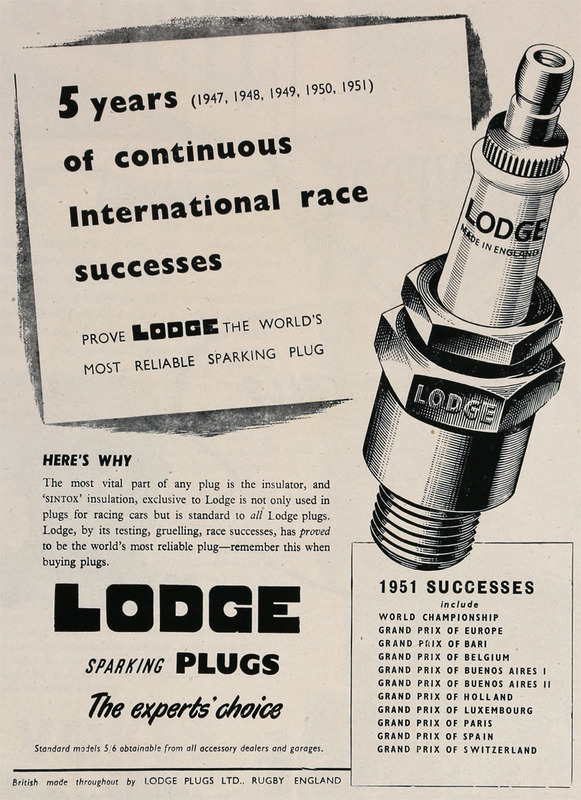 Between 1939 and 1945, Lodge doubled their output. Soon after war began the firm was registered as "an undertaking under the Essential Works Order." 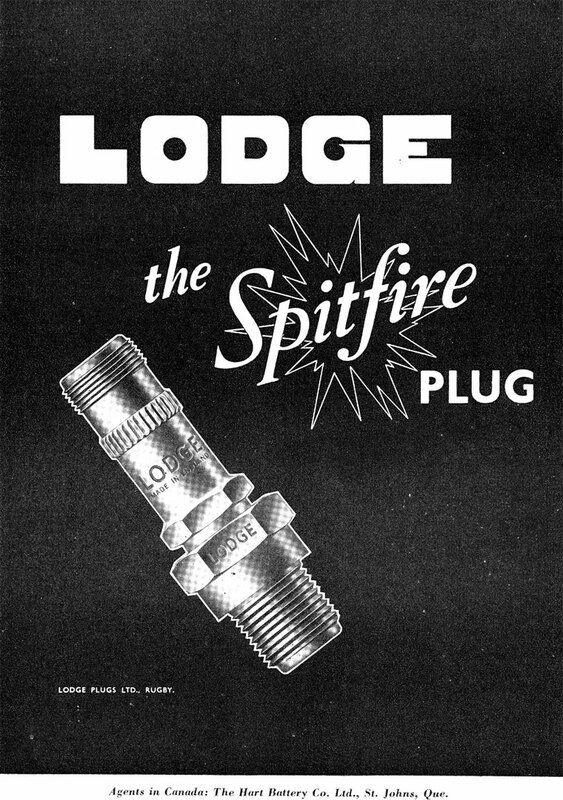 Plugs were produced for almost every kind of internal combustion engine - fitted in motor torpedo boats, landing craft, air-sea rescue launches, all varieties of military vehicle (including tanks), and stationary power equipment, Special adaptations of the sparking plug had to be designed for flame-throwers. 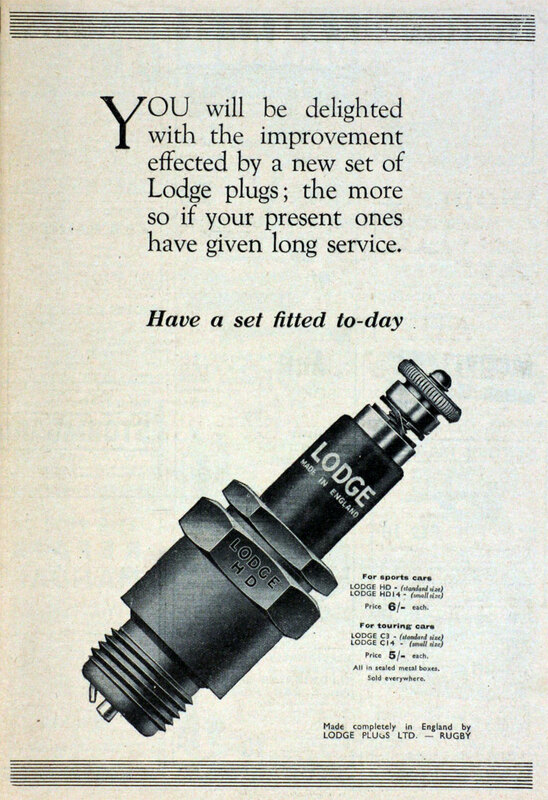 And for the new radar branches of all three Services radio screening fittings were made in large quantities. 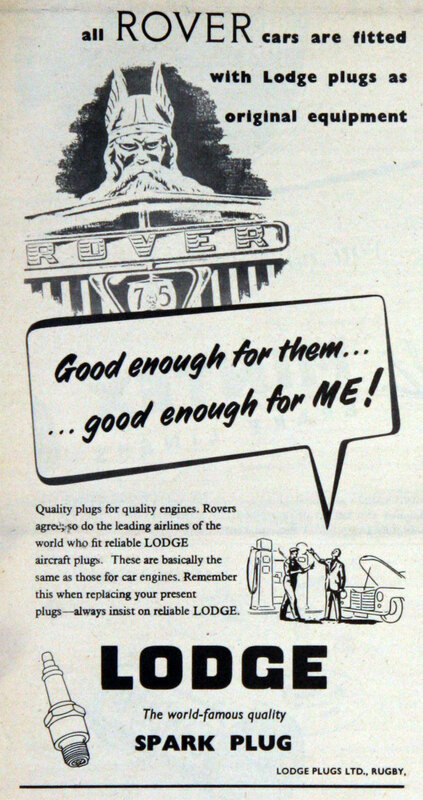 The biggest Lodge effort was to the R.A.F. and the American Army Air Force, which between them absorbed seventy-five per cent. of total production. 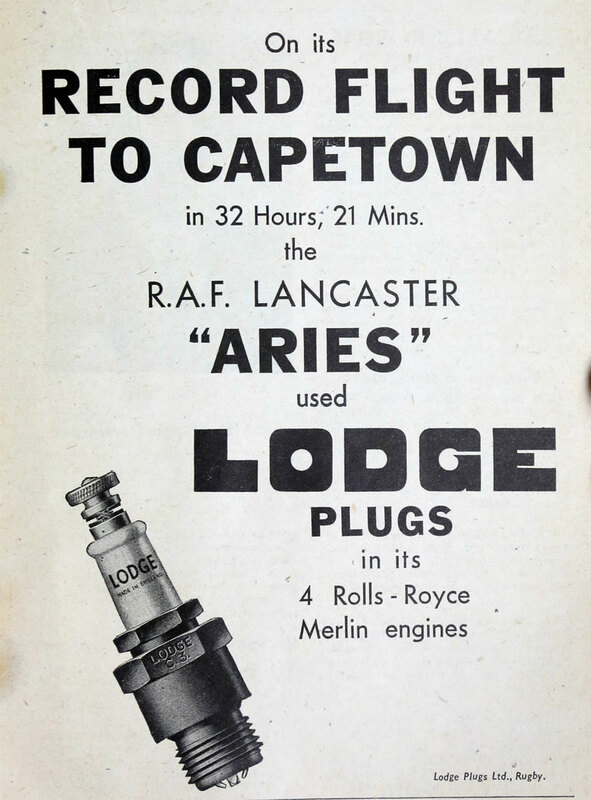 As in the First War, the effect of emergency was to force the pace of aero-engine development so rapidly that the stresses were too much for existing types of plug. In particular the increased heat of the engine and reaction of lead content in the fuel corroded nickel electrodes, and reduced the life of the plug to no more than a few hours of flying time. 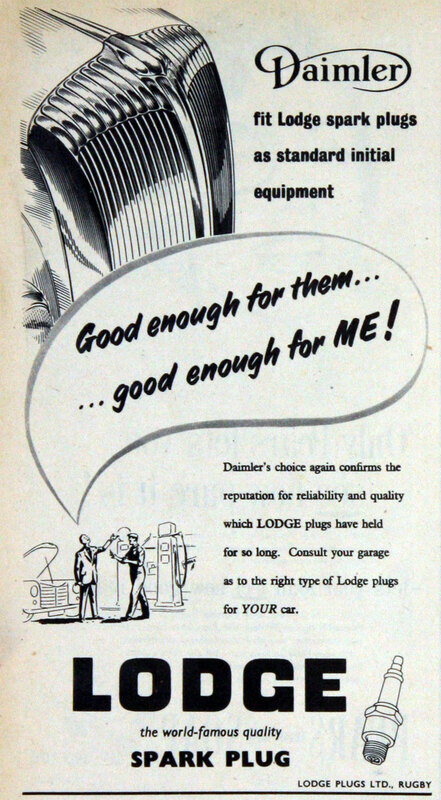 Lodge found the answer to this trouble in platinum electrodes, but before the method could be considered a complete success two major difficulties had to be overcome. 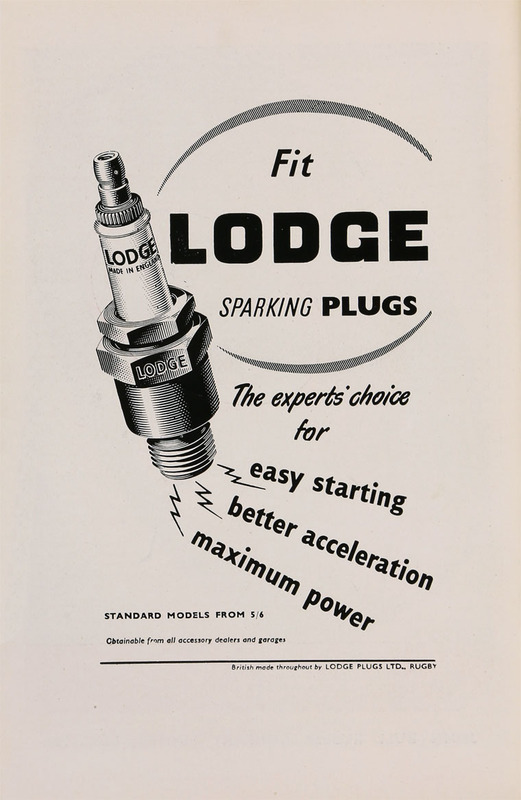 In the first place it was very hard to fix the platinum electrode to the steel body of the plug until Lodge scientists devised a way of melting the steel around the electrode with an electric current, and then allowing the steel to contract on to the platinum. This process was carried out very quickly by a machine tool, and so ingeniously that the platinum itself was unmelted, the joint formed between it and the steel body being admirable, mechanically and thermally. The second problem which had to be solved speedily was that with high-boost engines, such as the Rolls-Royce "Merlin" installed in the Hurricane and Spitfires, the platinum alloy was simply blown off. In the early days of 1940 Fighter Command was greatly worried about this failure. The answer was found in "S" Alloy, an extremely important invention that came from the Lodge laboratories at a very critical moment. It provided and electrode of thoriated platinum, made by a powdered metallurgy process, and it stood up bravely to all the fury bottled in the new engines. 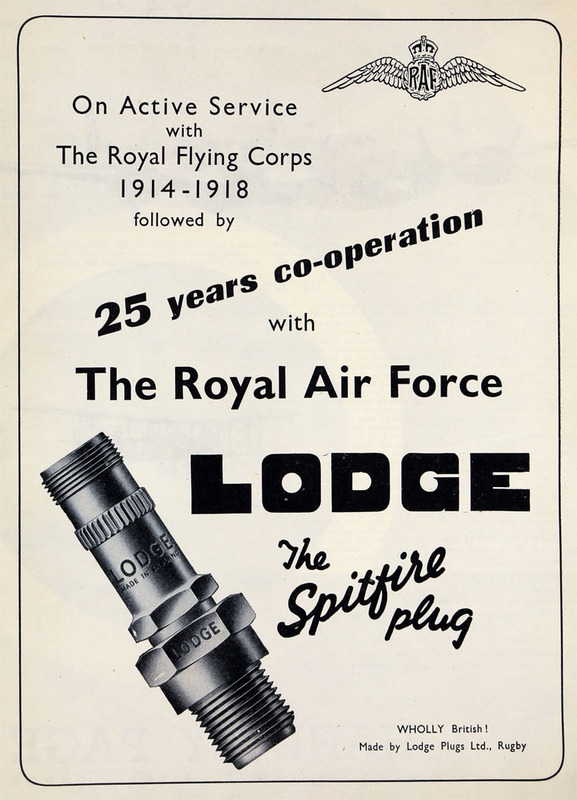 By 1942, it had proved itself completely, for bombers as much as for fighters, and the service life of a plug had been increased to more than three hundred hours, with all that meant in added safety and confidence to tired crews, The value of these inventions was quickly recognised by the Air Ministry. 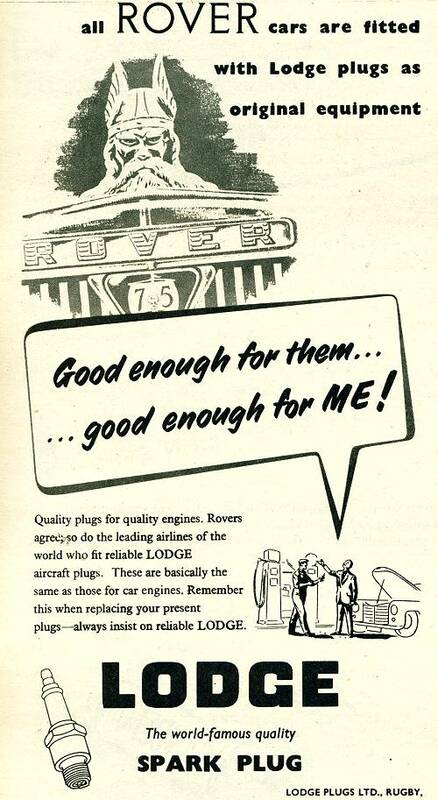 They have since been adopted universally by both British and American manufacturers, and now are used by airlines all over the world, as well as in plugs for racing cars. 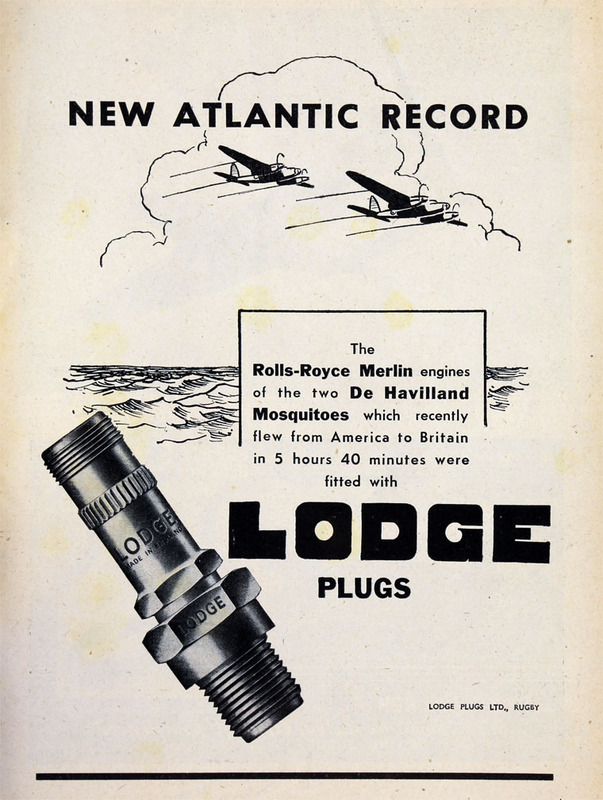 When America came into the war, and the Liberators and Flying Fortresses of the Eighth Air Force began to arrive in England, they were suffering from the same plug troubles which we had encountered earlier. 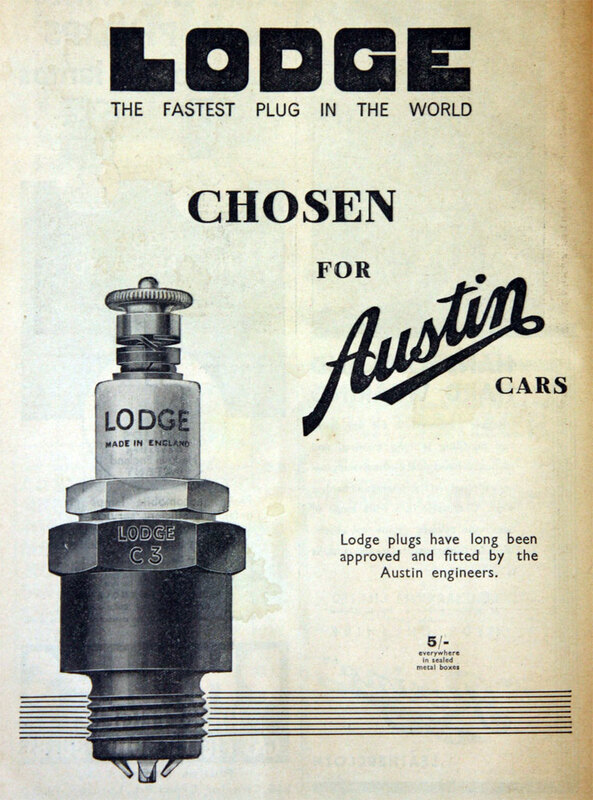 Lodge immediately adapted their latest ideas to a special plug to fit the American engines, and this was so successful that it became the rule to fit all American bombers with Lodge plugs (or those of Lodge design) on arrival in this country. 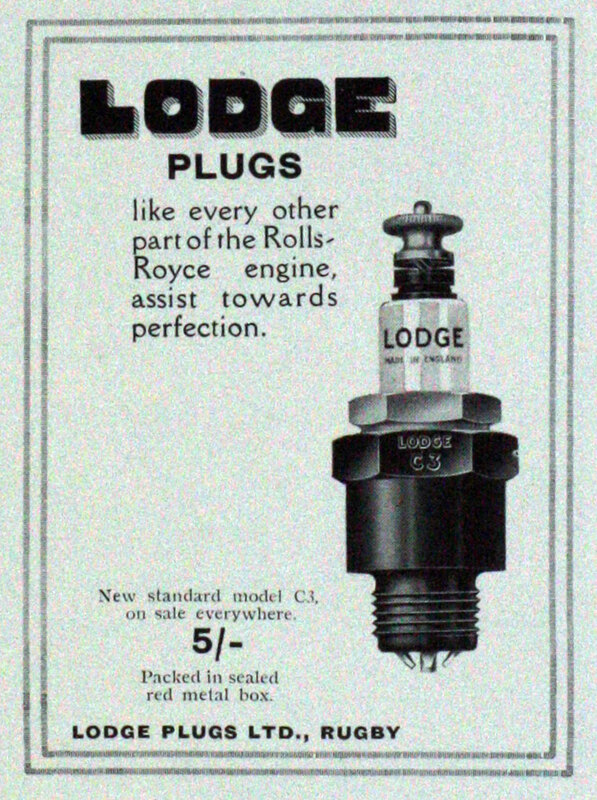 Another remarkable plug introduced during the war, and remembered with affection by the R.A.F., was the Long Tom, a very portly member of the Lodge series which was designed for the Bristol sleeve-valve engines used in some of the biggest British bombers. Needless to say, in all these new patterns Sintox proved invaluable as an insulator. 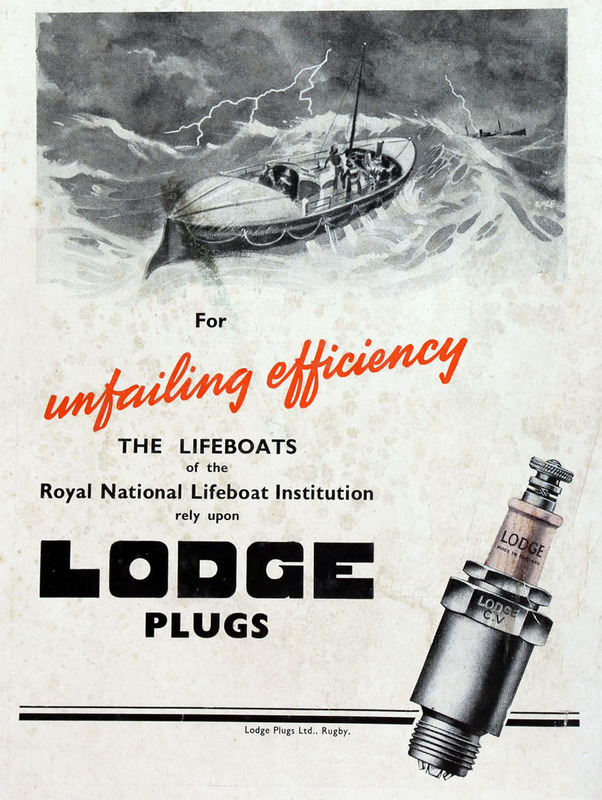 It was exceedingly lucky that this had passed all its tests and become standard to Lodge production before the emergency began. 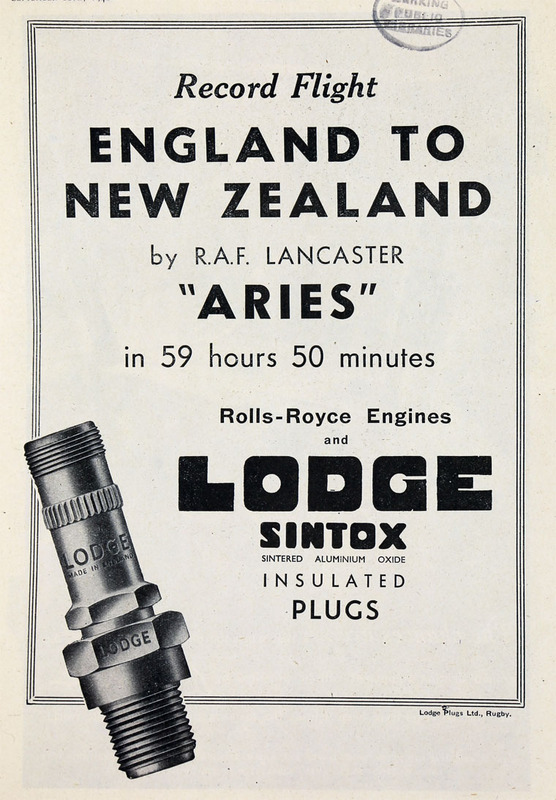 With Sintox the Mosquitos broke the record for the Atlantic crossing, and the Lancaster flying laboratory, "Aries", carried out its famous flight over the North Pole. 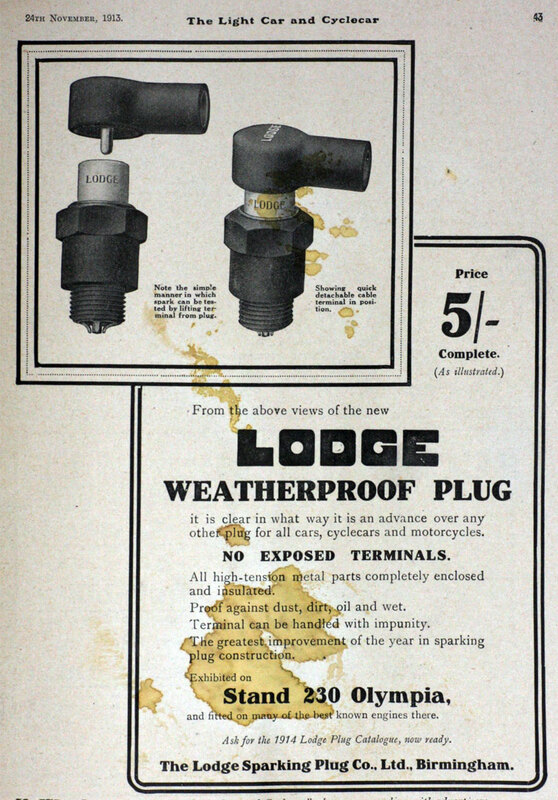 1944 Advert for heater plugs. Towards the end of the war the development of the jet engine demanded fresh thought about ignition, for in the absence of cylinders a single jet-igniter took the place of the vast array of sparking plugs needed in a conventionally driven aircraft (as many as 244 in an airliner with four piston-engines). 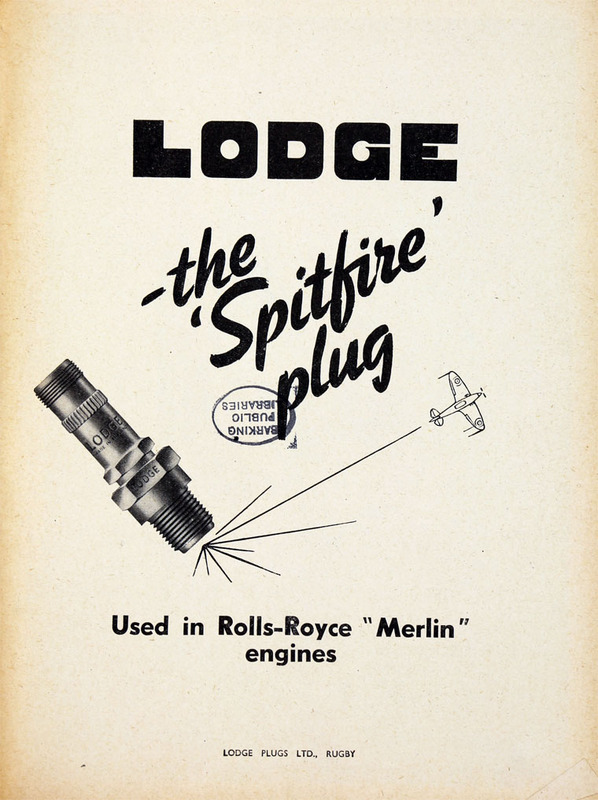 Once more Lodge worked out such a satisfactory answer in an untried field that today its jet-igniters are the only type used in the jet-engines made by Rolls-Royce and De Havilland. 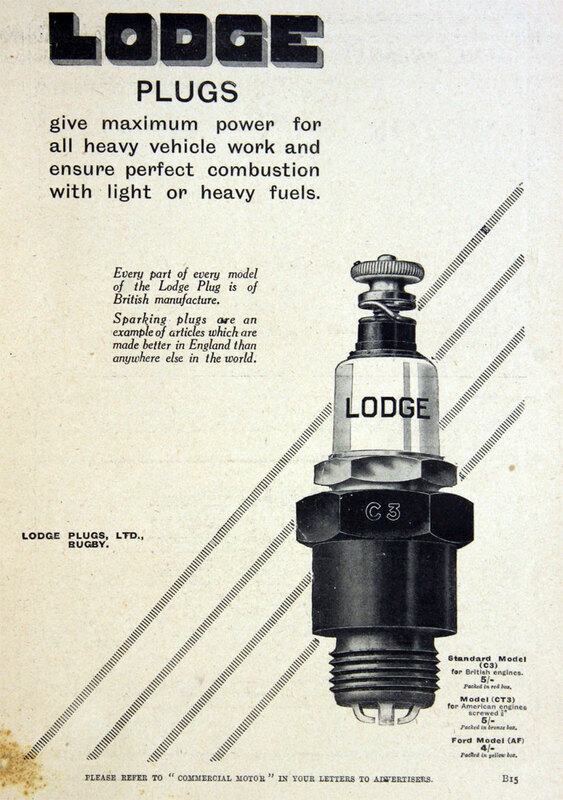 And by a curious chance it was found that the circuit employed by Sir Oliver Lodge in his original "B" spark igniter system was ideal for the new engines. 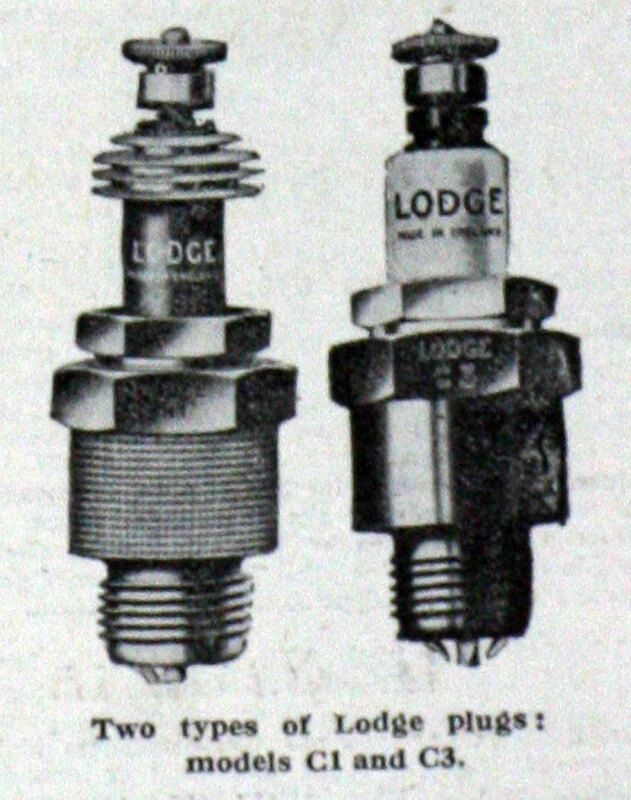 Of all the novel equipment produced by the Lodge scientists under the pressure of war, none was to be of more far-reaching benefit in peace than the Thermo-Couple Plug developed by Dr. C.J. Smithells. Engine designers had always been handicapped by the impossibility of telling the exact internal temperature of an engine while it was going, a fact which had led to a great deal of guesswork, and indeed of controversy. Now at last the inner mysteries of the cylinder-block could be accurately probed, for the Thermo-Couple measured electrically the internal heat of each cylinder of an engine under actual running conditions; and for the first time the engine designer could till at a glance if his product was behaving as mathematics had prophesied it would. This new instrument acted as a normal sparking plug, while at the same time it recorded the temperature of the tip of the central electrode, in the very flame of the power explosion. Valuable information, about which designers had previously been obliged to conjecture, soon came to light. It was found, for instance, that a considerable difference is possible in the heating of the individual cylinders of a car engine. Measurements of the thermal effect of mixture strength showed that maximum heat corresponds with maximum power output, and that - contrary to the general belief - a weak mixture is not necessarily a cause of rising engine temperature. 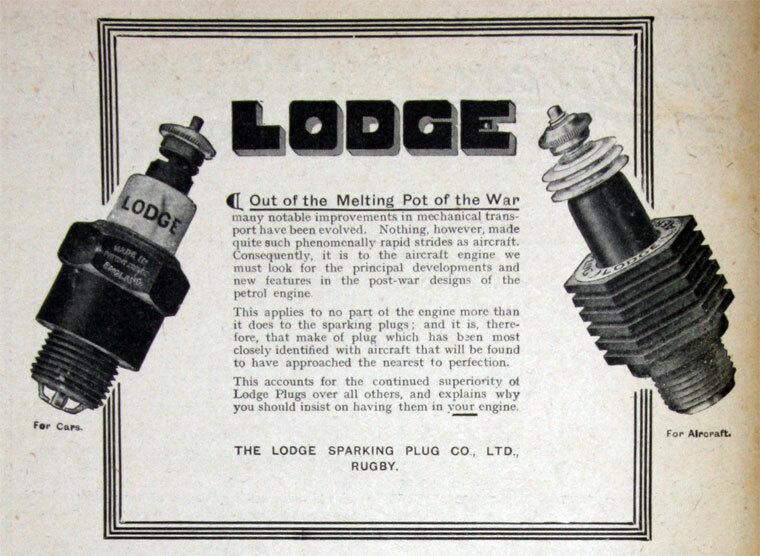 Other tests revealed the range of temperatures during which pre-ignition and auto-ignition occurred, and the surprising fact that the wartime Pool petrol produced greater heat and quicker pre-ignition than 100 Octane. 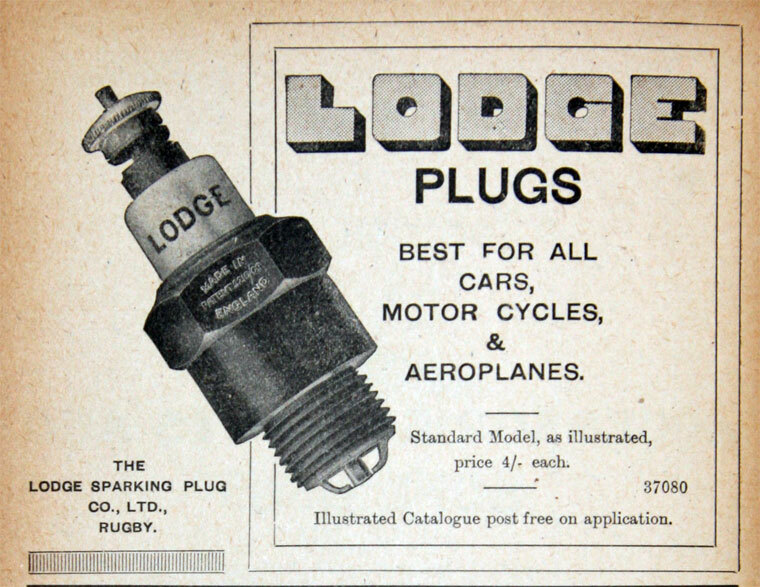 When the war ended it was clear that Lodge would have to be ready for a still greater demand for their plugs; a rapid increase in commercial flying would certainly be added to the inevitable boom in private motoring. The factory at Rugby, which has an area of 105,000 square feet (all of it convenient on the ground floor, and almost entirely glass-roofed) had seemed adequate in the '30's, but was now obviously insufficient. 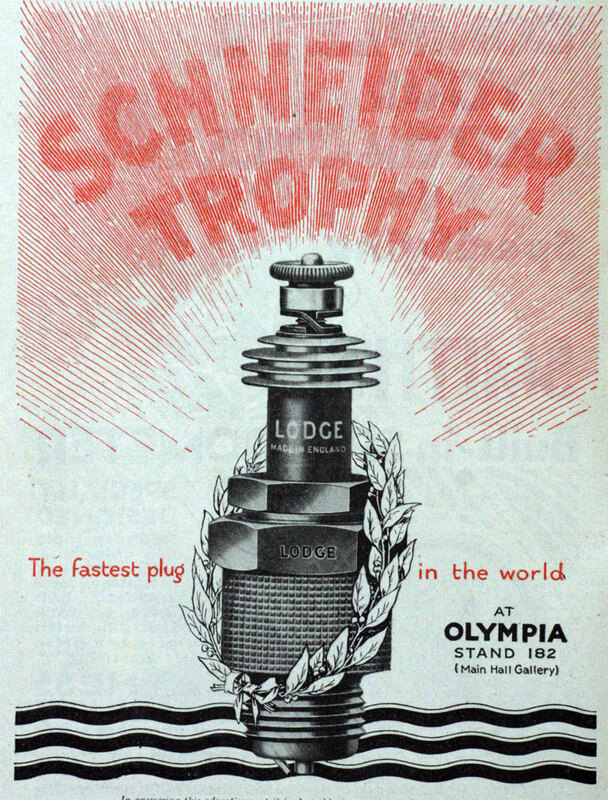 And so as soon as possible, mainly for the production of commercial plugs, the company took over the shadow factory at Olney, near Northampton, which it had operated during the war. This is a three-storey building with a floor area of 37,000 square feet. Shortly it was working at full capacity, and is helping to step up the Lodge export drive, which already has reached about fifty per cent. of total production. 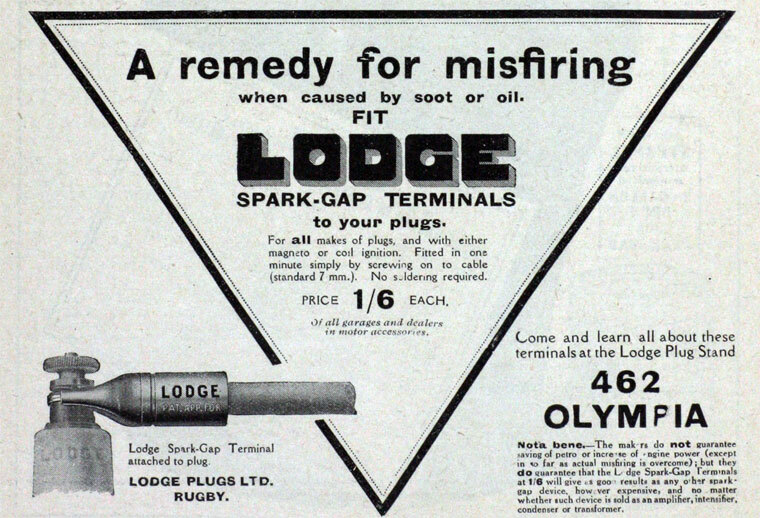 The genius of Sir Oliver Lodge, which had unexpectedly showed itself again during the designing of the jet-igniter circuit, was recalled once more when in 1947 a new electro-filter plant was installed at the Rugby factory, for it was developed from some of his early research work. This plant recovers the dust from the ceramic machining operations. Under the bag-filter system previously used, machines had to be stopped every hour or so while the bags were cleared, and this resulted in a loss of between ten and fifteen per cent. of the workers' time. With the new plant there is no interruption of work; it is only necessary to stop the machines at the dinner hour and again at the end of the day, when the collected Sintox powder is decanted into sacks. Even in powdered form Sintox in not harmful to health, but the cleaner atmosphere produced by the plant makes for much more pleasant working conditions. Equally important is the enormous saving. In one year enough raw ceramic material is now recovered to make more than four million plug insulators. The new plant is ninety-nine per cent. efficient, and is similar to the dust-extractors at the great power stations. 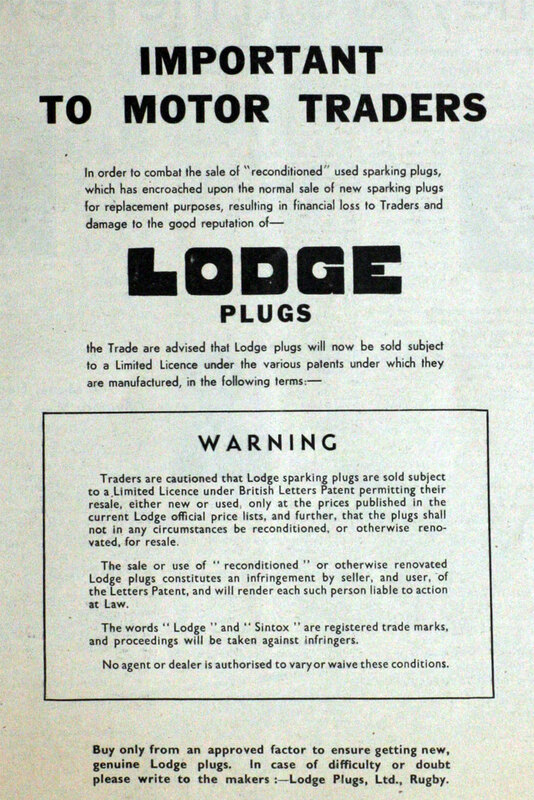 In 1949 the shareholders elected to sell their interest, and Lodge Plugs Ltd. was floated as a public company. 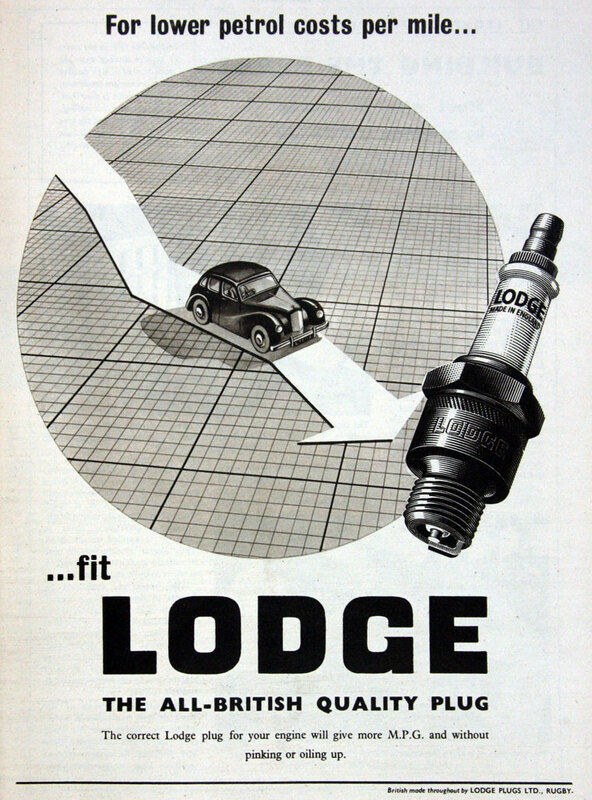 Brodie Lodge, who had seen the firm grow to its present prosperity from its modest beginning in his Birmingham bedroom, and had done so much to make it famous, now retired, after 45 years in the saddle; and Mr. Hopps became Chairman and Managing Director, continuing his overall responsibility for design. 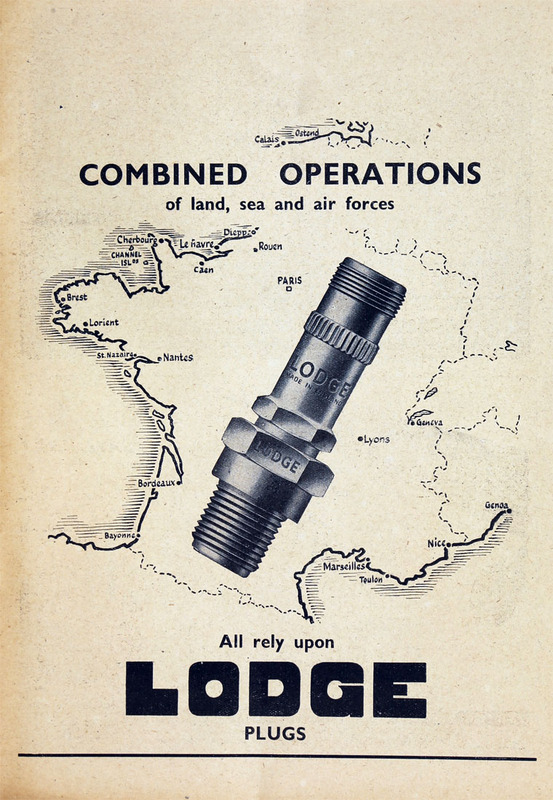 In 1953 there was a further re-arrangement, when V. Martin-Jones was appointed Managing Director, Mr. Hopps remaining Chairman and still directing the company's research. 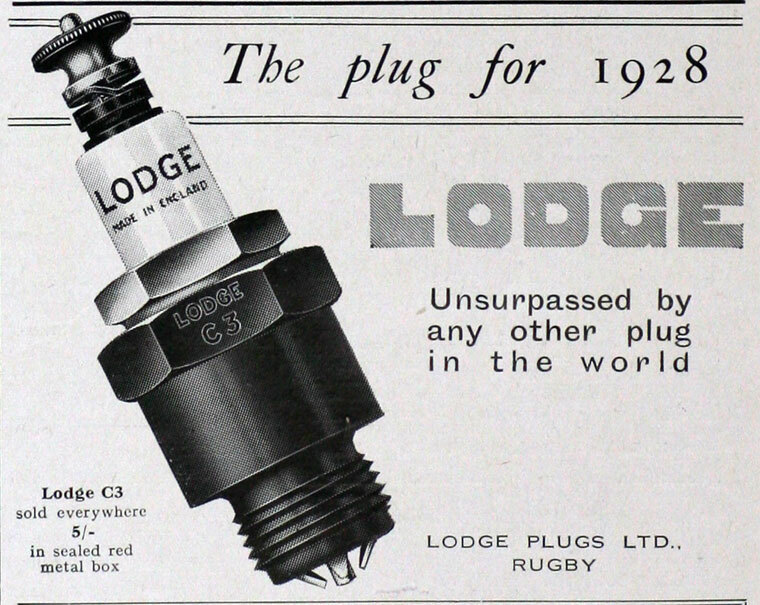 Since the war the history of Lodge plugs closely reflects the remarkable advances inspired by military need. 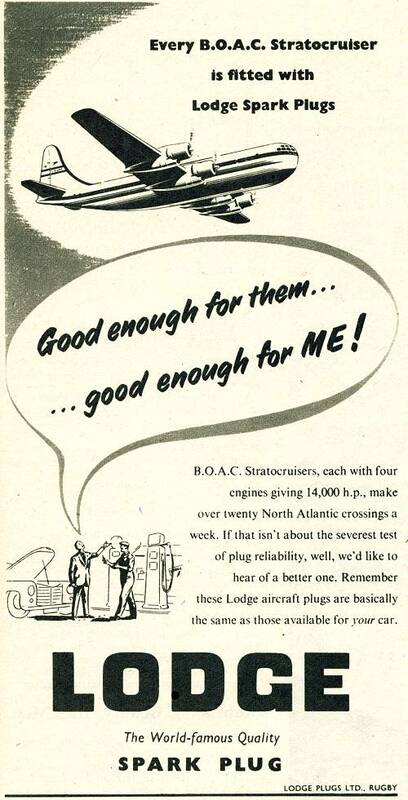 This time there was no lag in civil aviation, and the proved efficiency of the new platinum electrode made of "S" Alloy created an immediate demand among the airlines getting under way again. 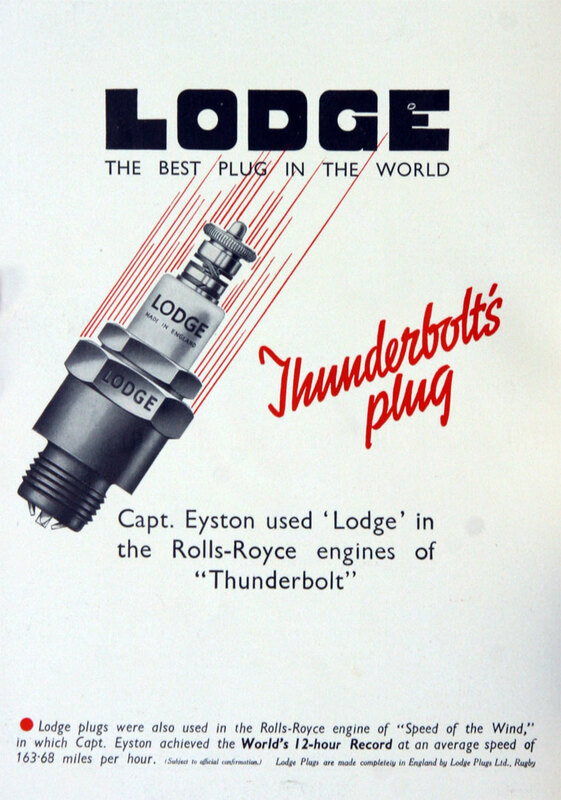 Experience with the special Fortress plug led to the production of a new type of plug for American engines, and as these were installed in almost all the aircraft then used by continental airlines the quantities required were very large. 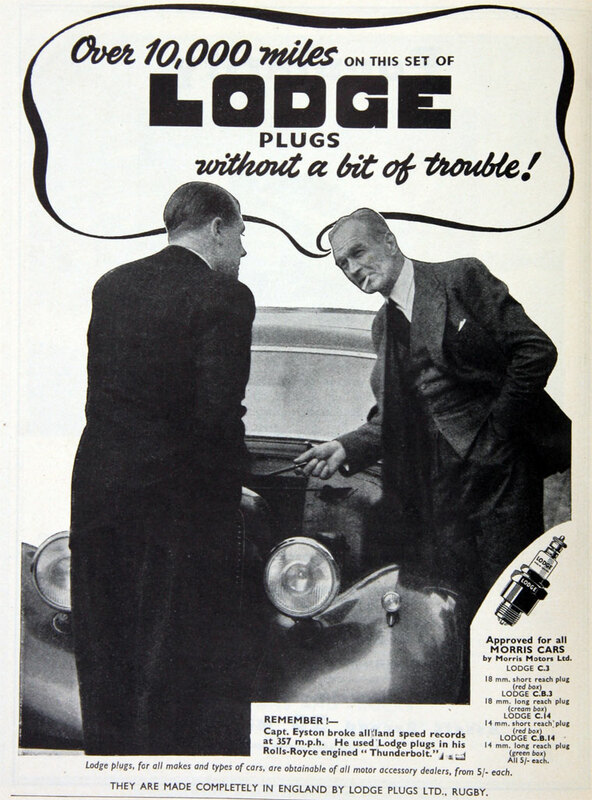 Other plugs were standardised for such firms as Rolls-Royce and Bristol, and are now extensively used by B.O.A.C., B.E.A., Aer Lingus, K.L.M. 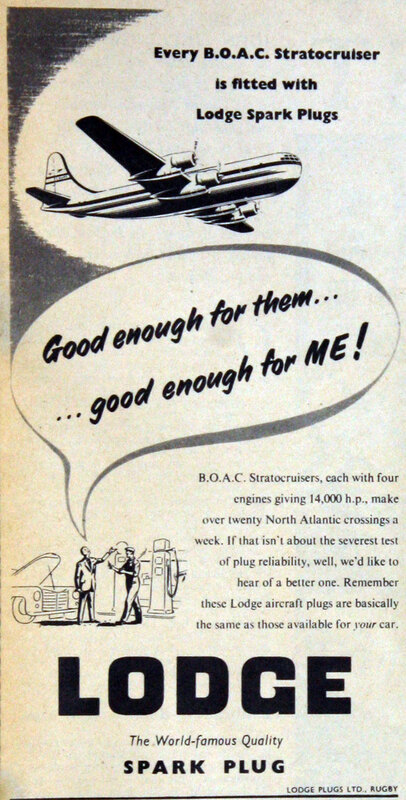 and Trans-Canada Airline. 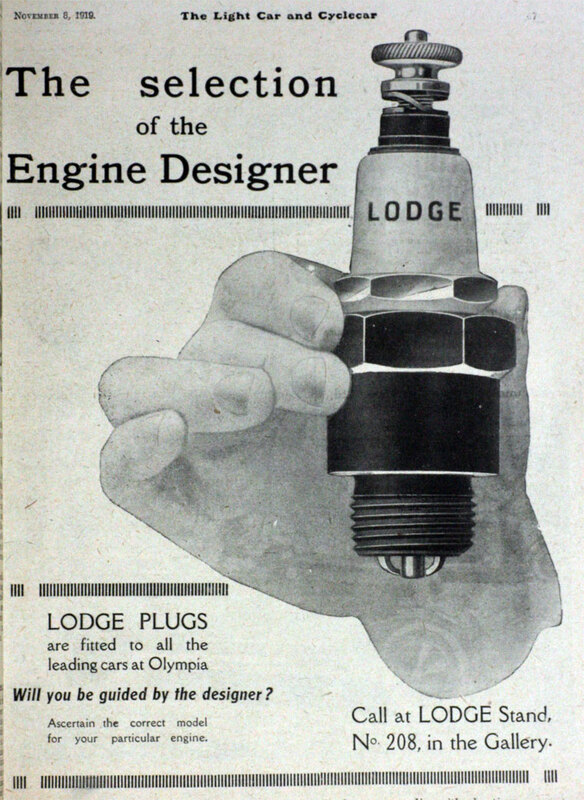 In the introduction of the jet engine to civil flying the Lodge jet-igniter is also playing a leading part, and both with jet-igniters and conventional plugs Lodge remain busy on the military side as well. This great expansion in its business of aircraft plugs has led the company to set up a special section to keep close liaison with the airlines of the world, and with manufacturers of aircraft engines. The problems with which this has to deal are more and more intricate, for a plug suitable for one engine is seldom so for another, and prolonged testing by makers and operators is required by authority before a new design is allowed to be used in flight. This page was last edited on 22 February 2019, at 11:24.